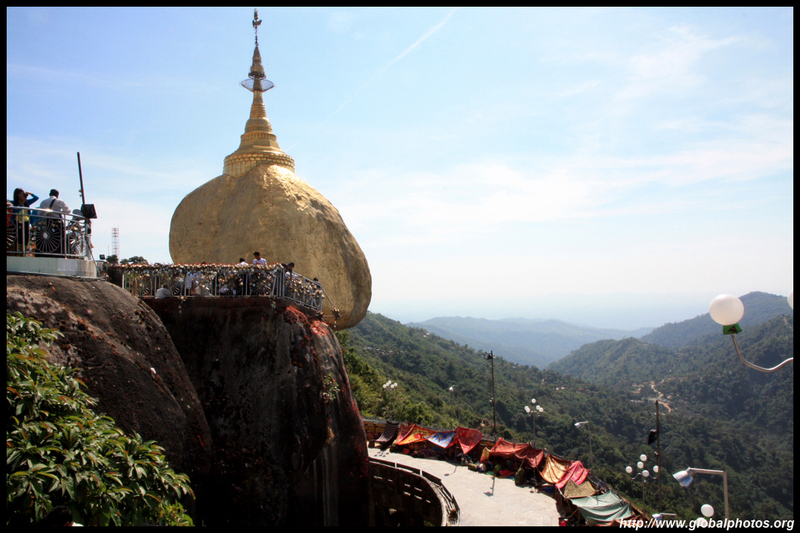 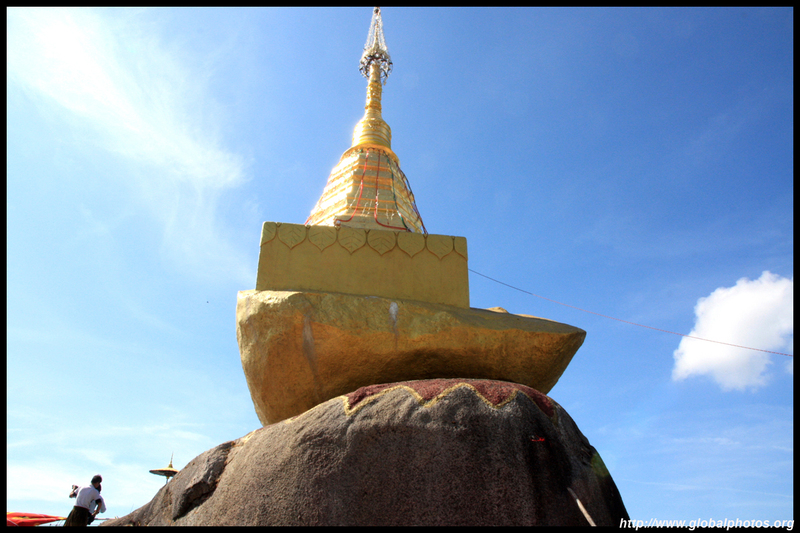 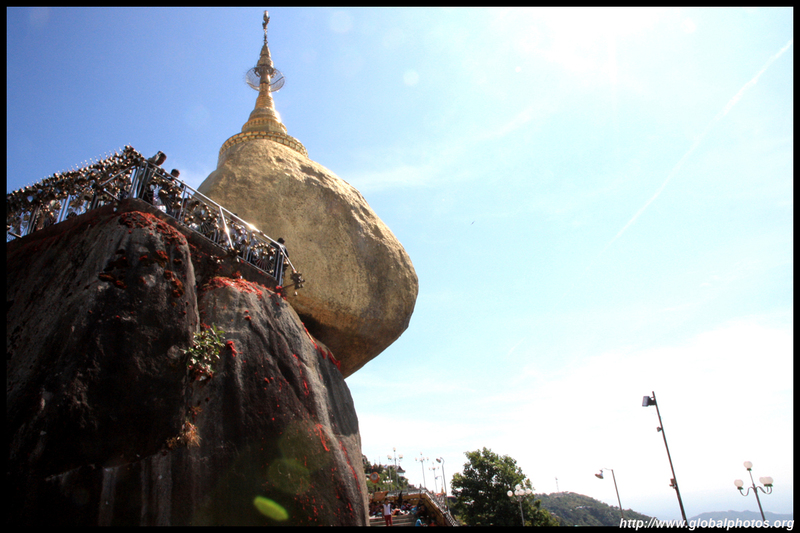 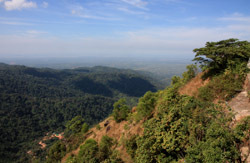 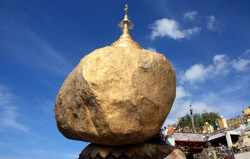 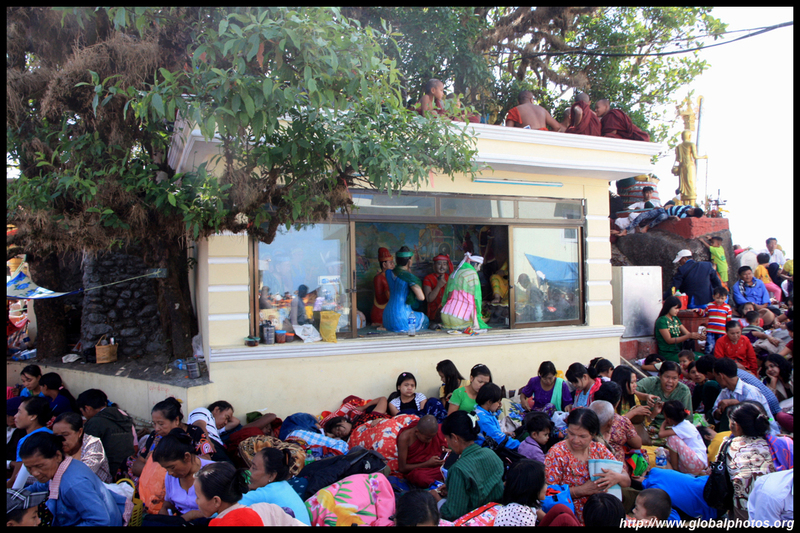 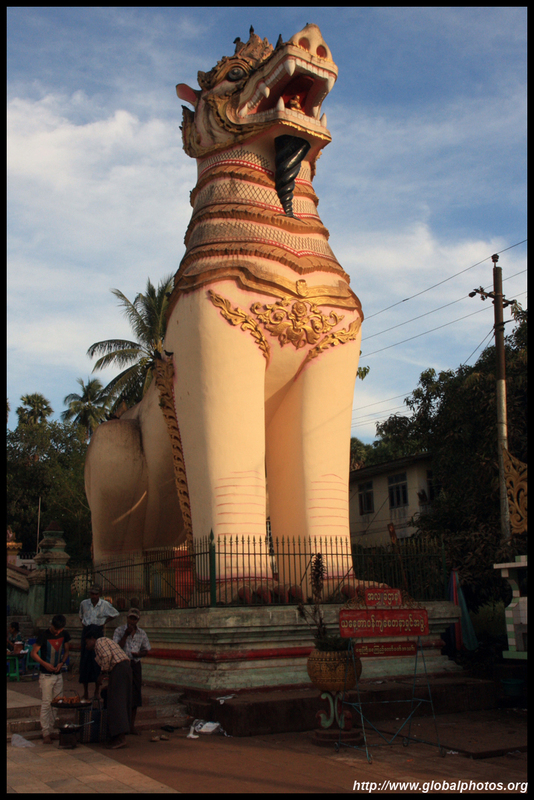 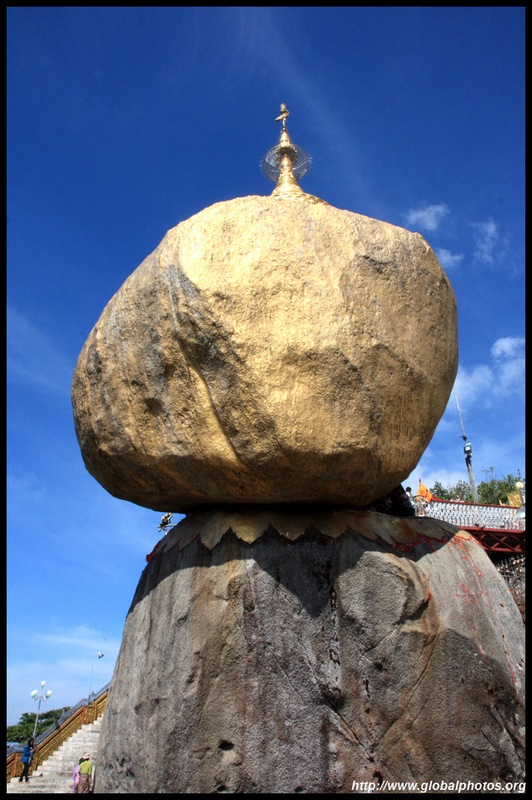 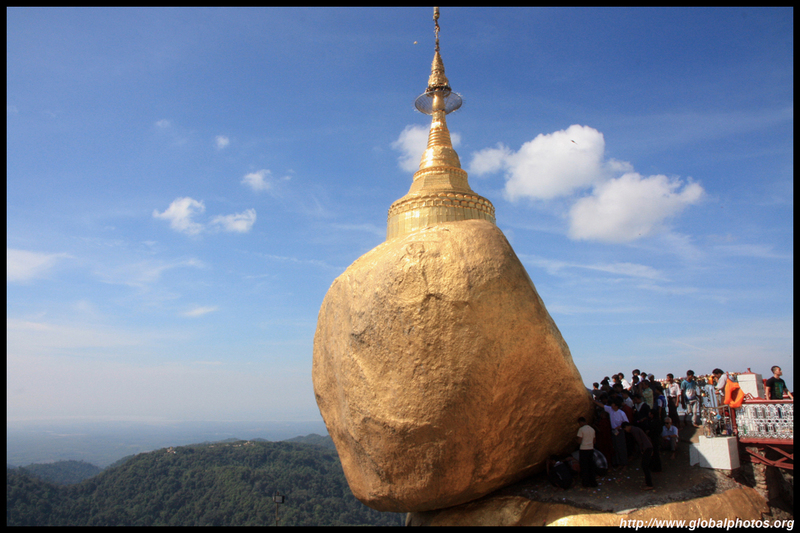 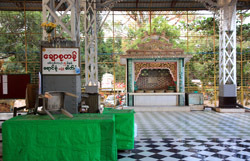 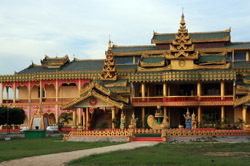 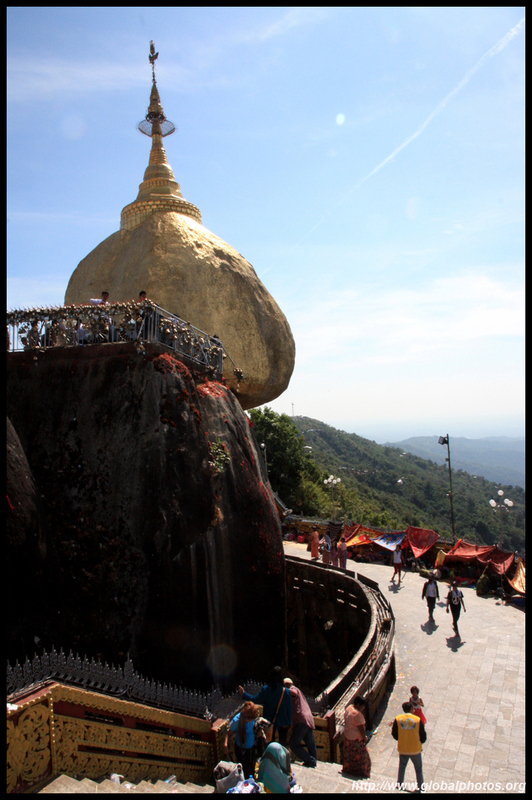 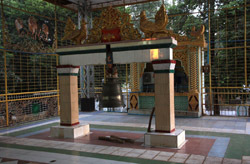 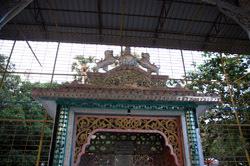 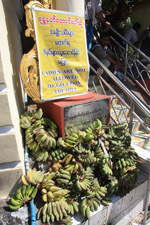 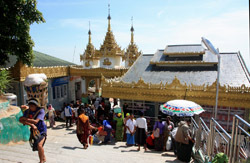 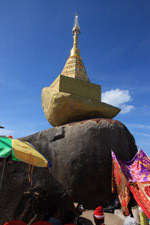 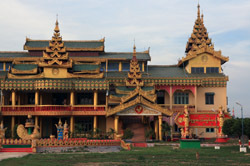 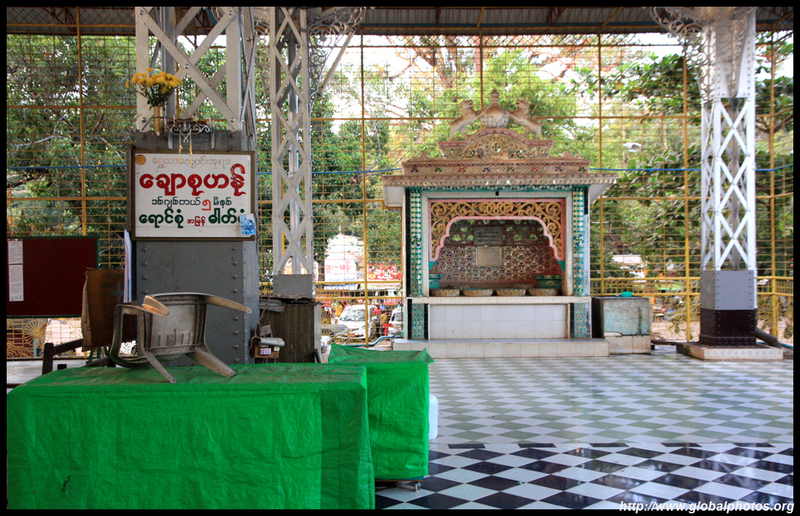 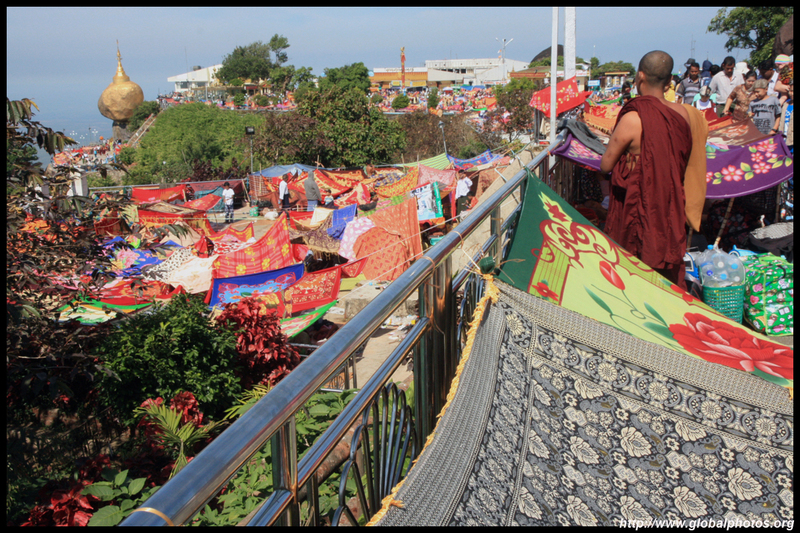 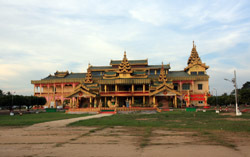 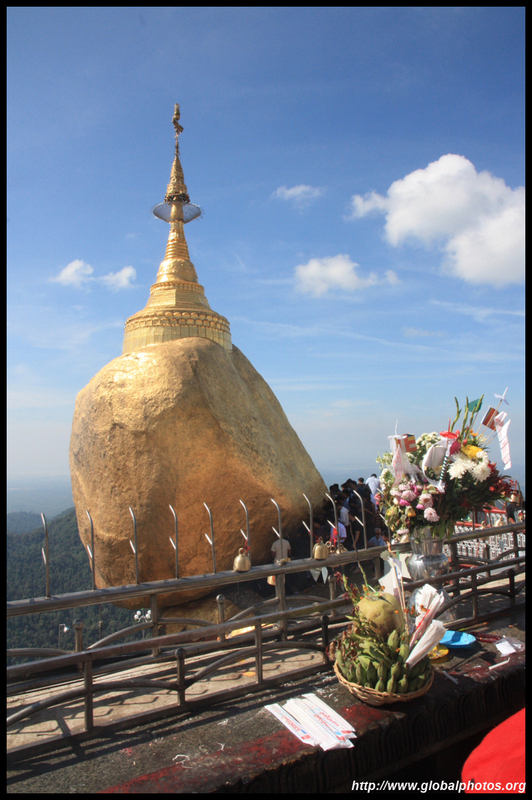 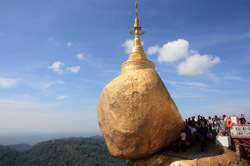 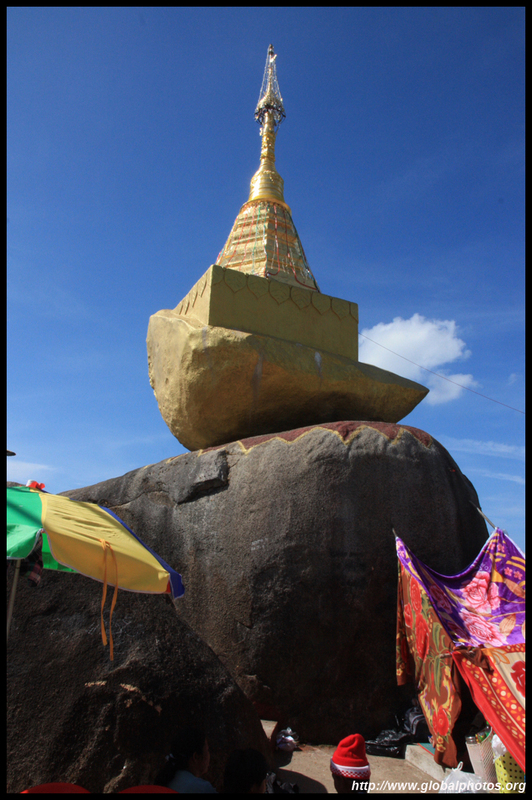 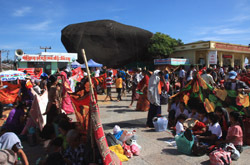 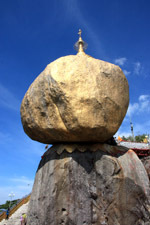 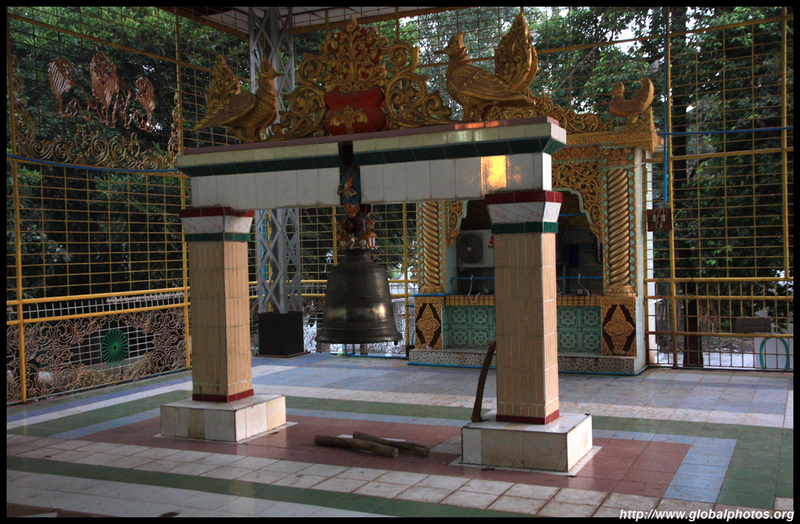 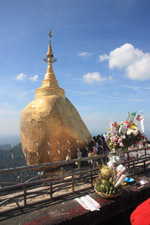 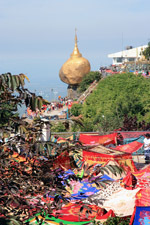 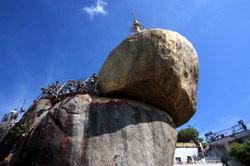 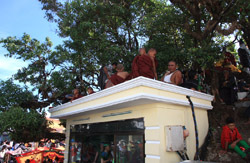 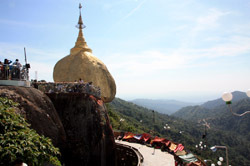 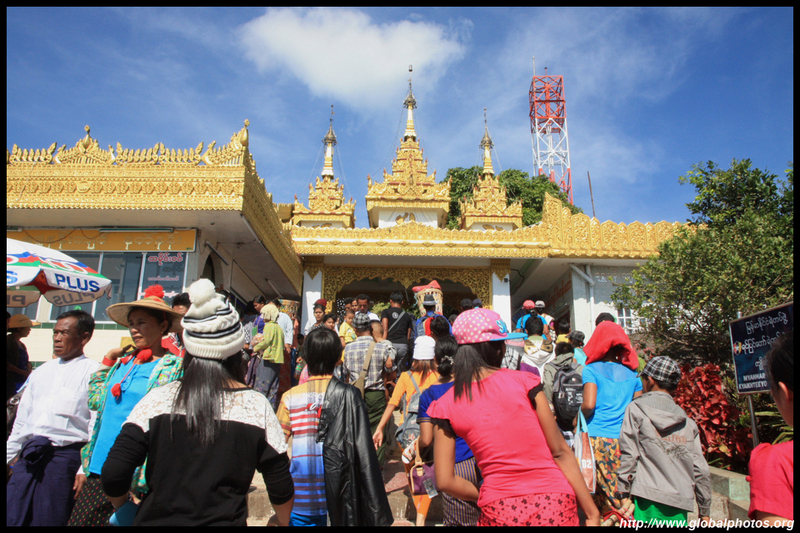 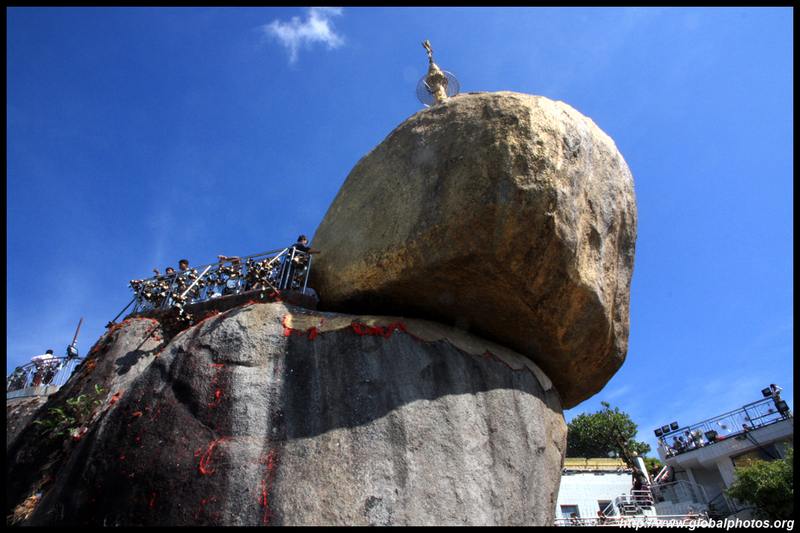 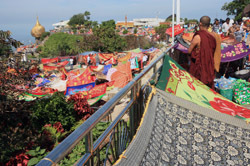 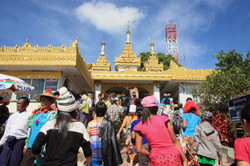 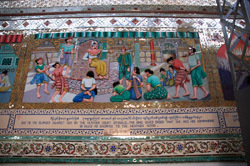 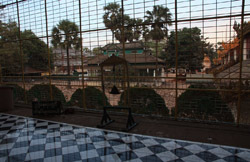 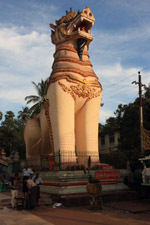 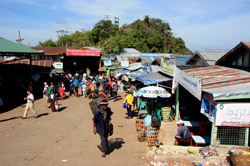 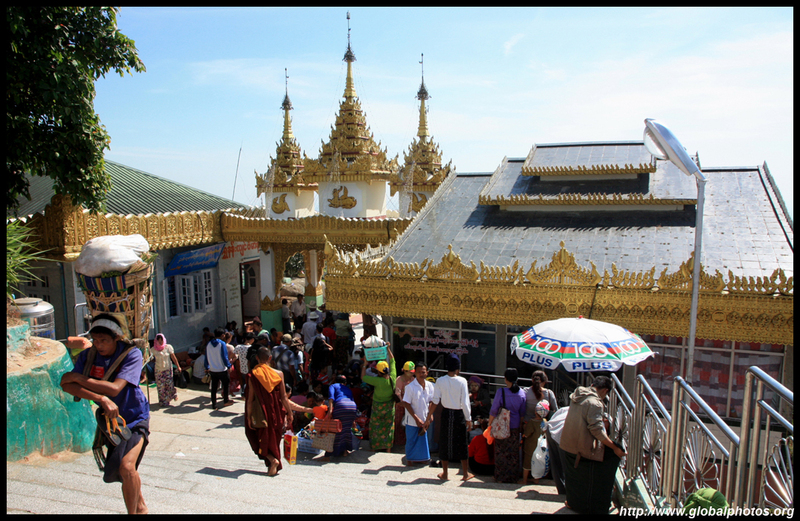 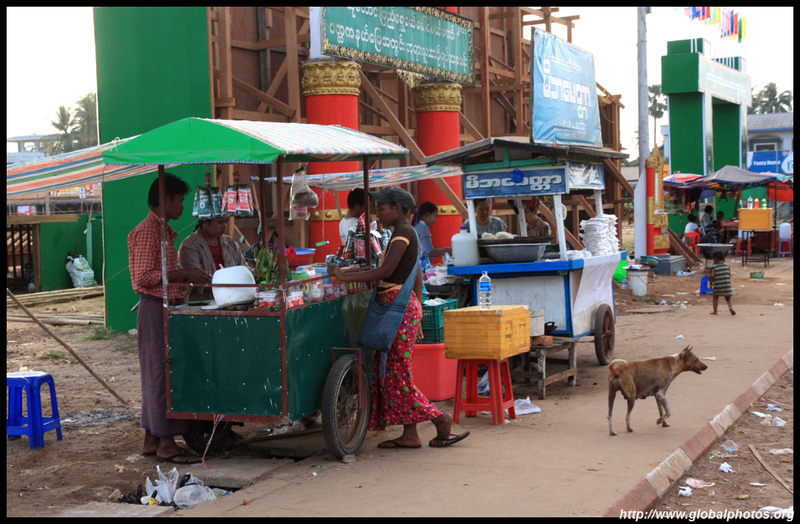 Kyaiktiyo is a major pilgrimmage location for Buddhists. 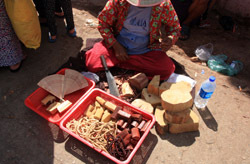 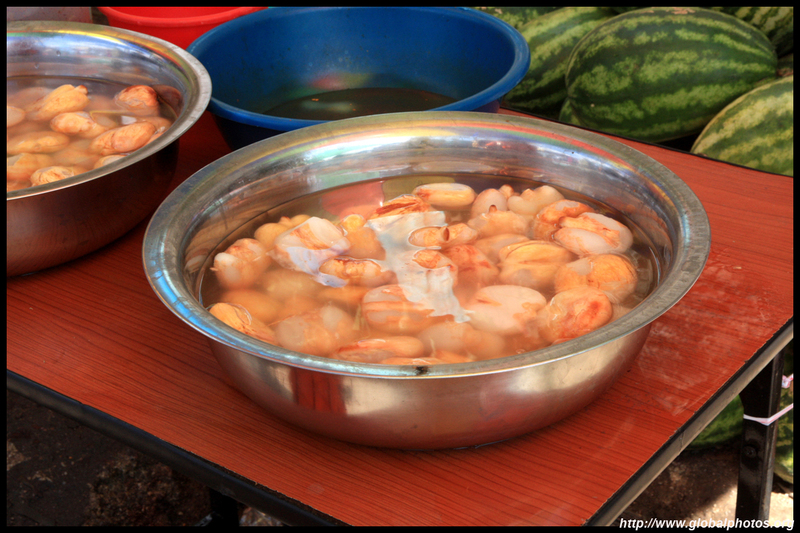 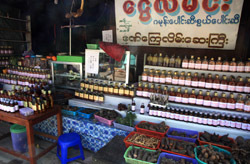 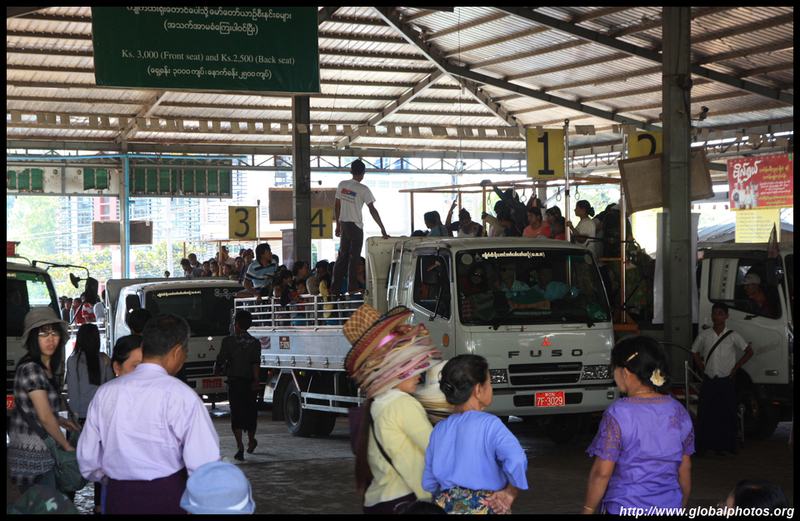 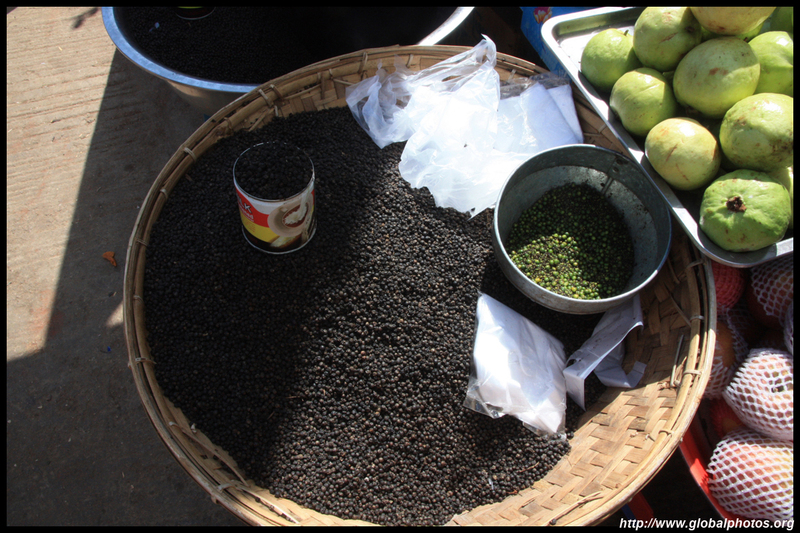 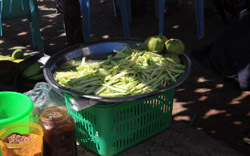 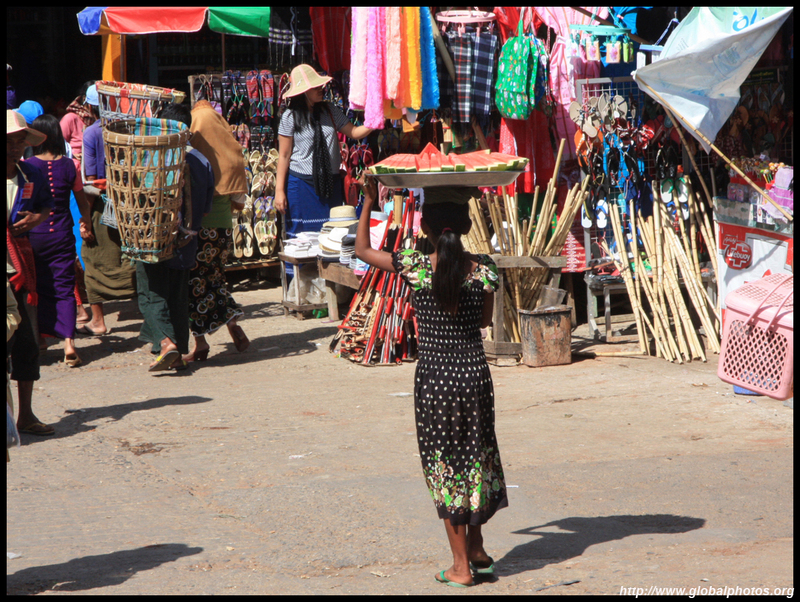 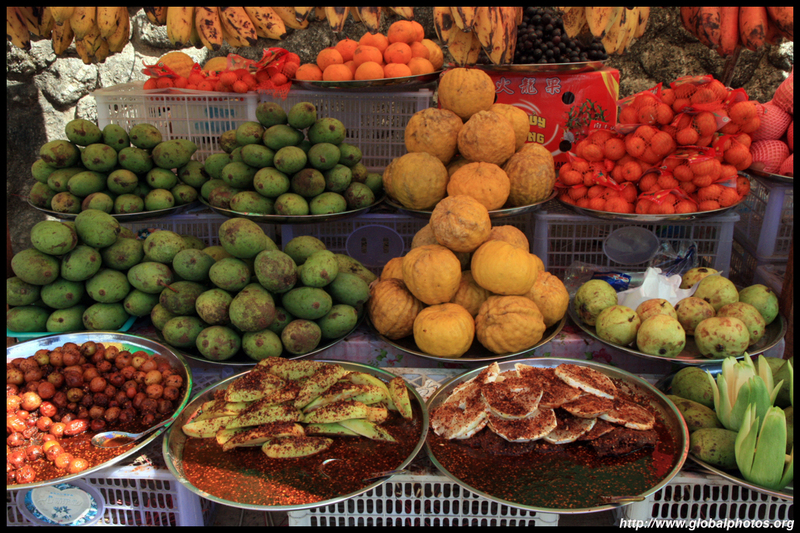 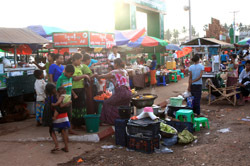 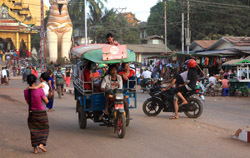 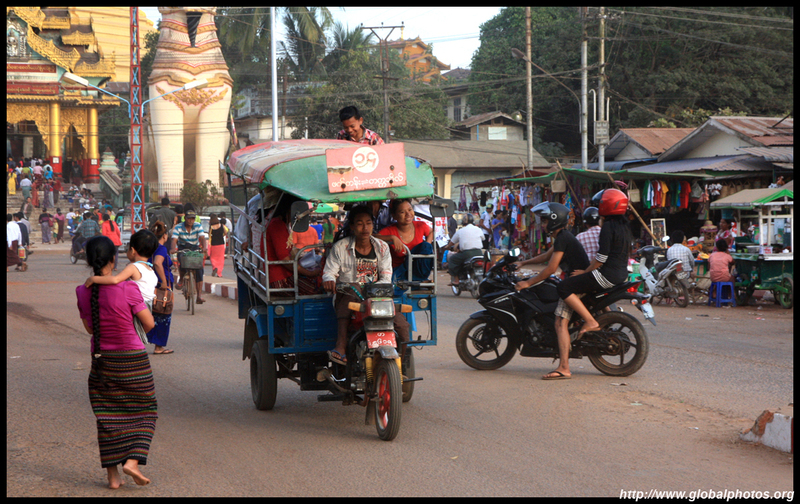 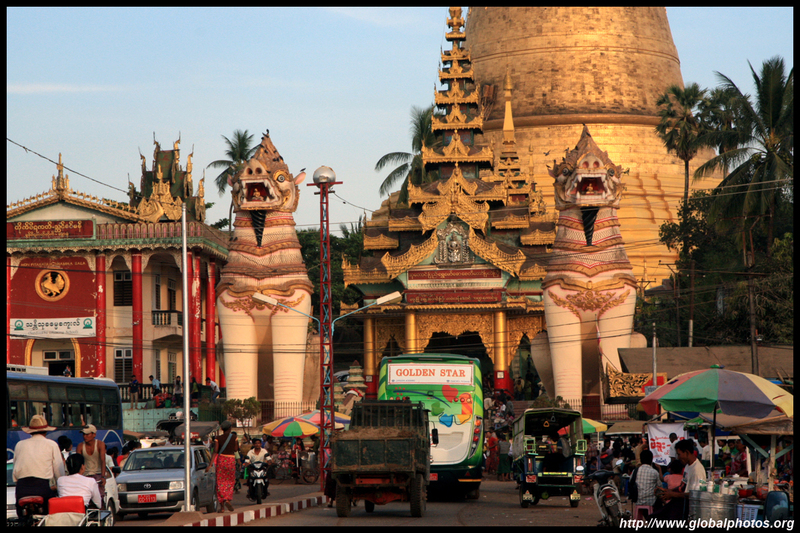 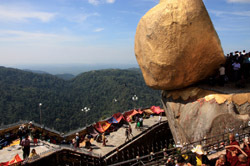 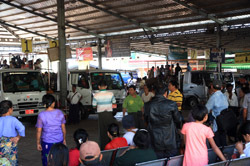 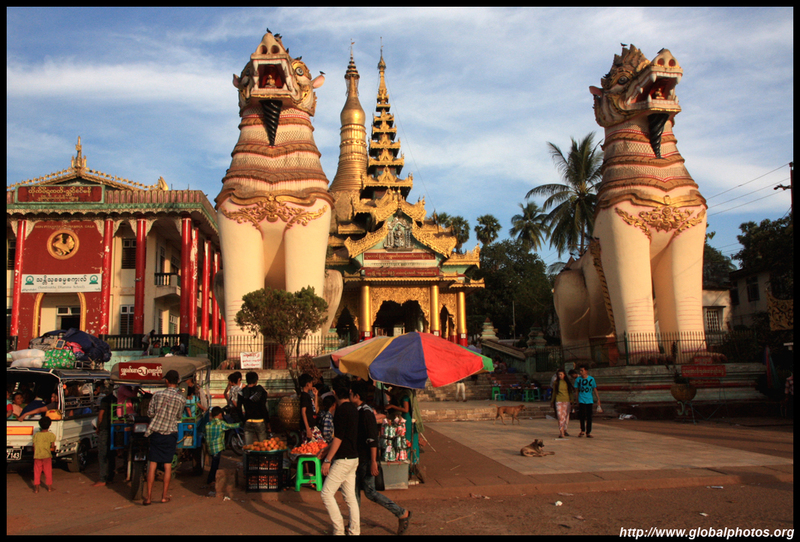 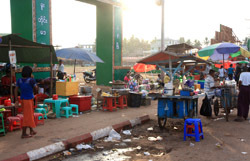 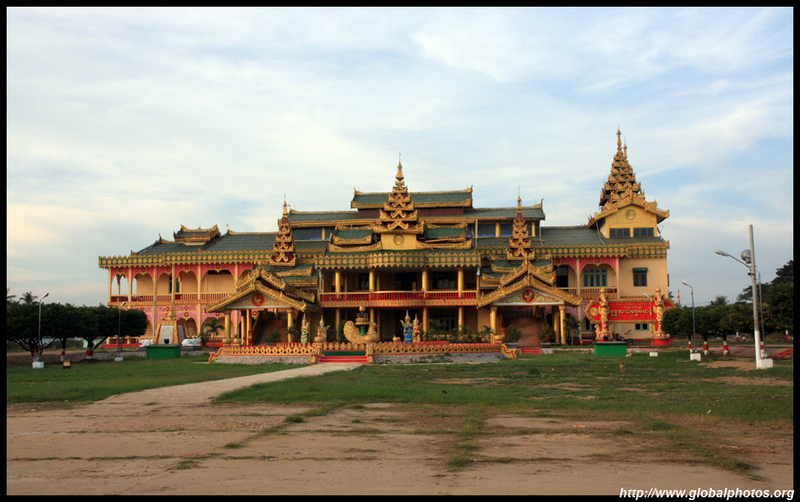 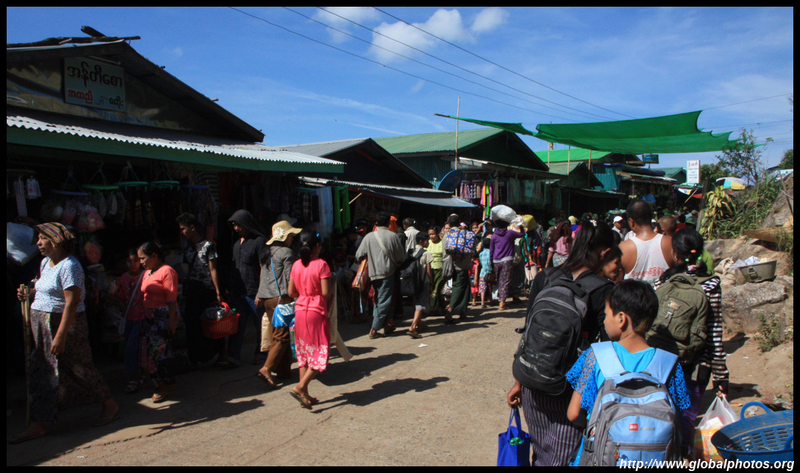 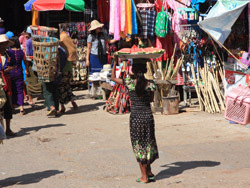 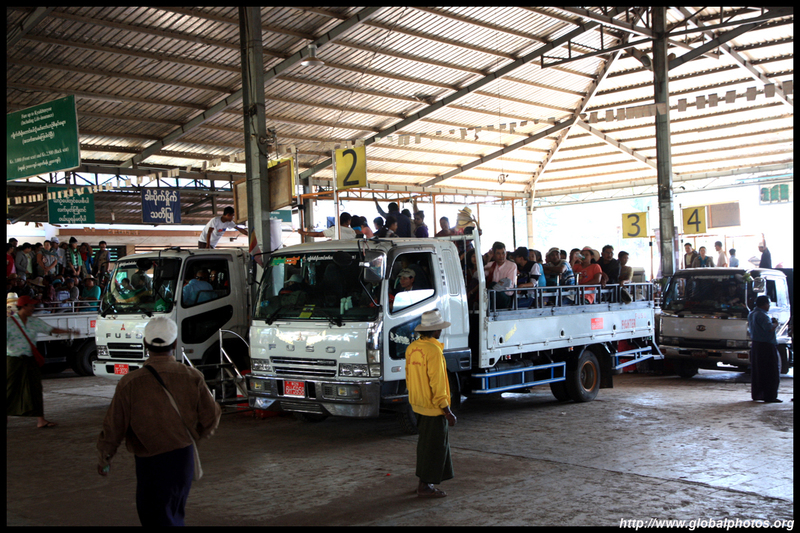 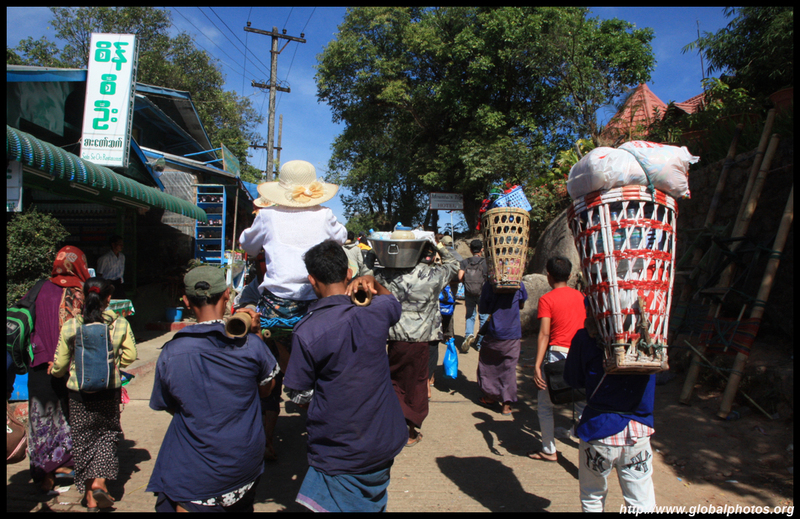 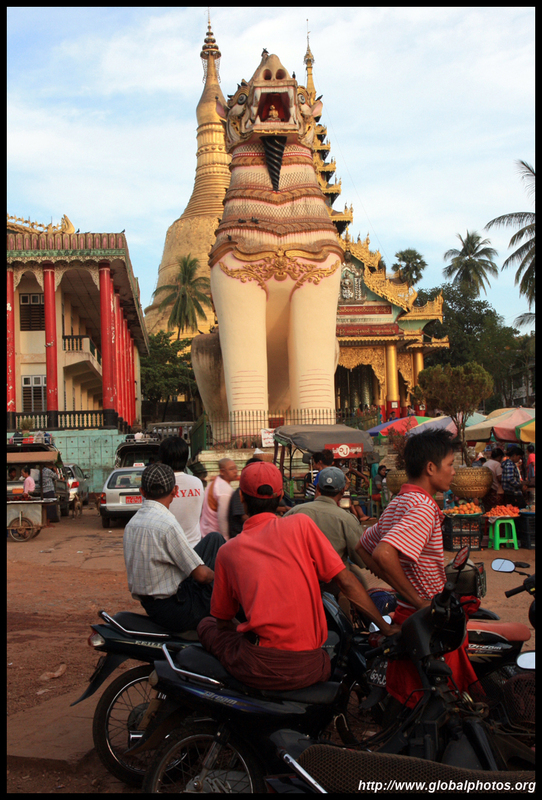 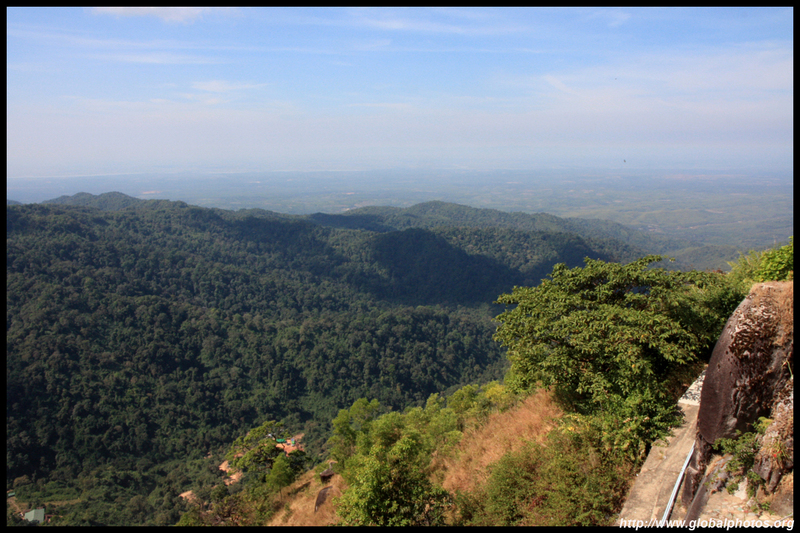 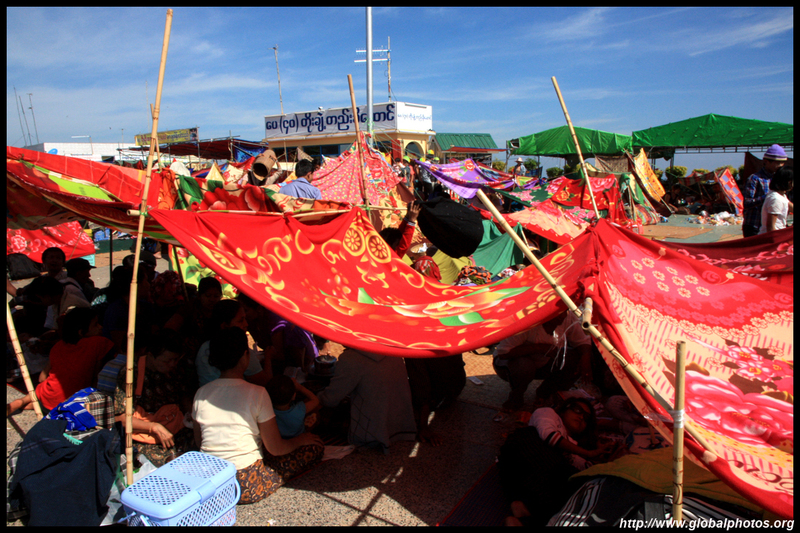 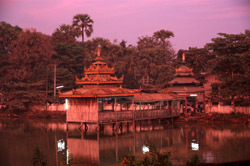 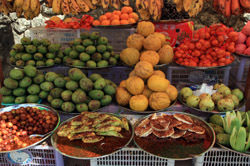 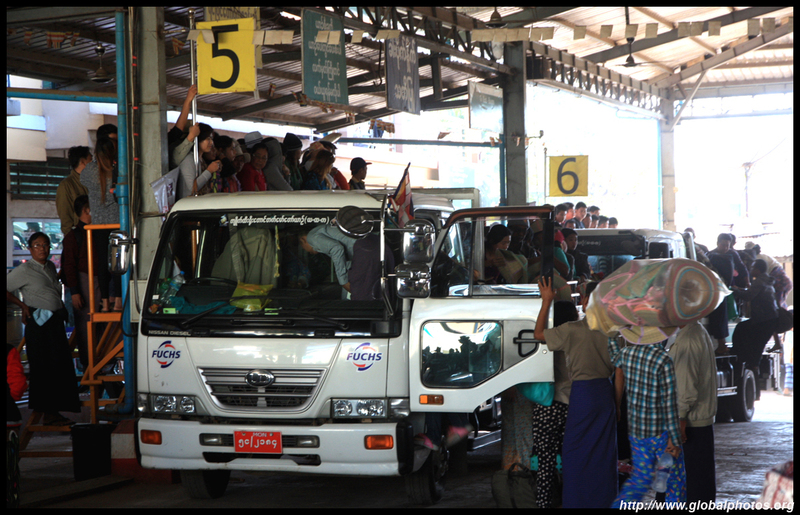 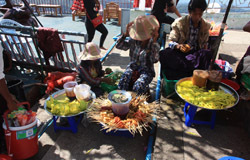 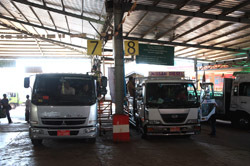 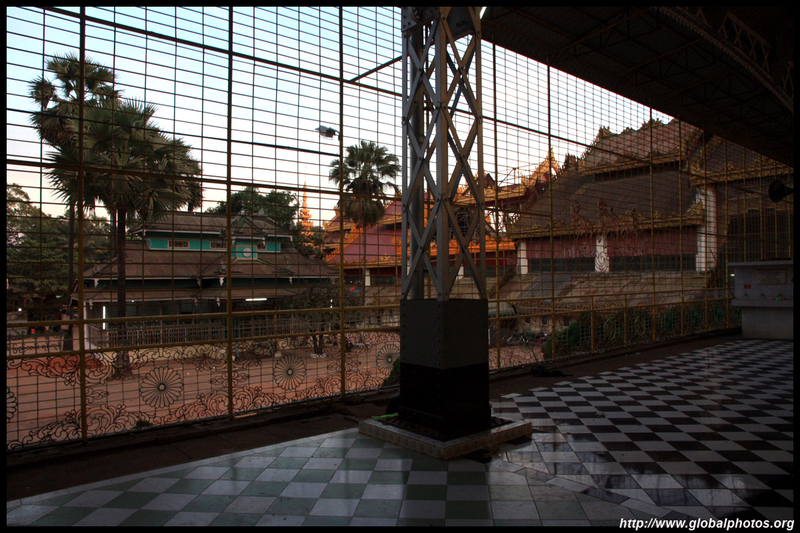 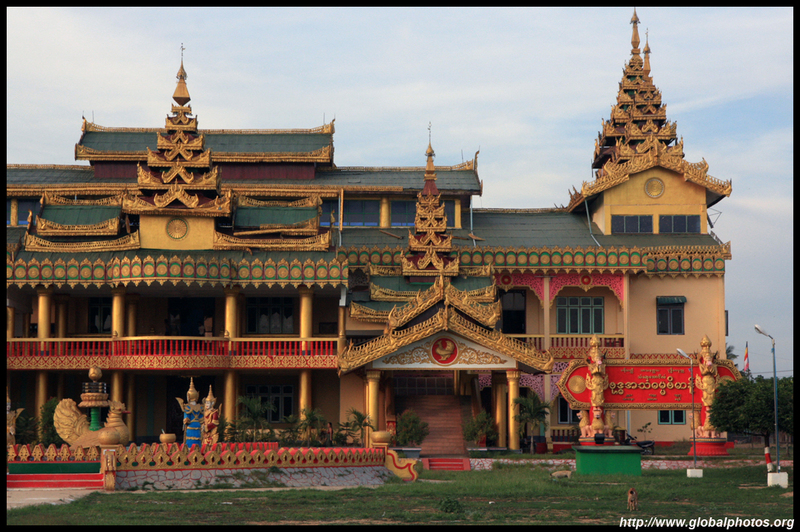 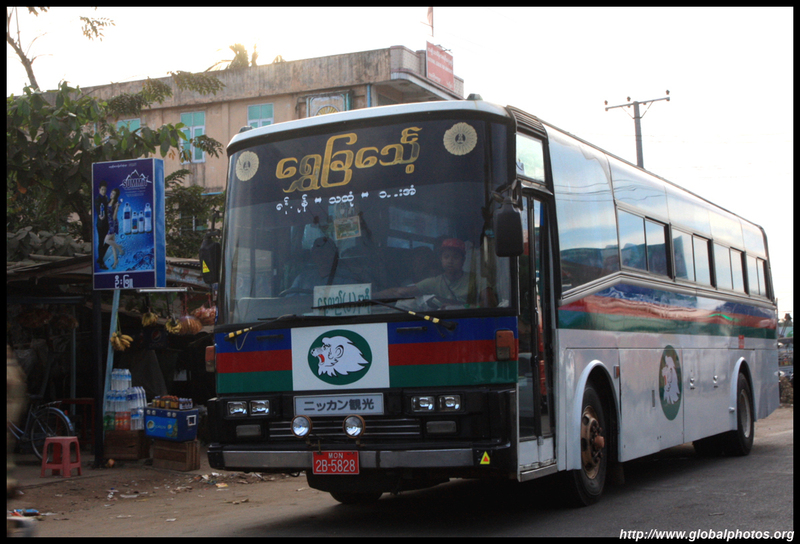 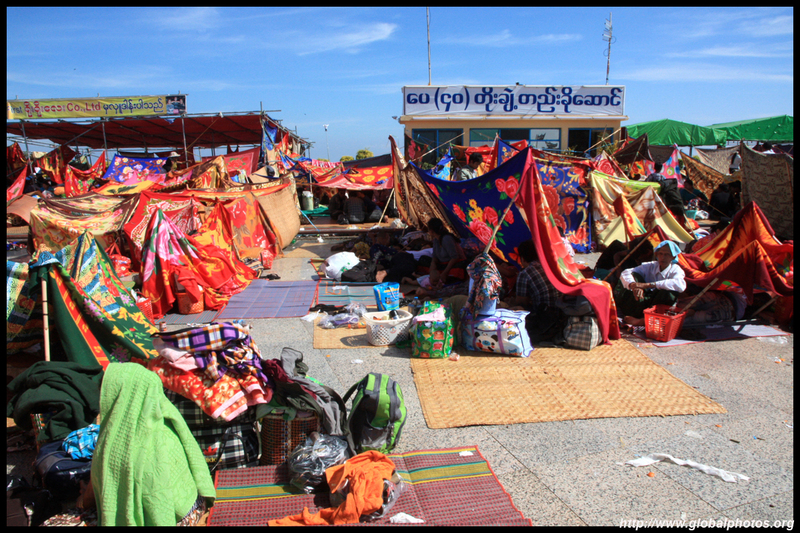 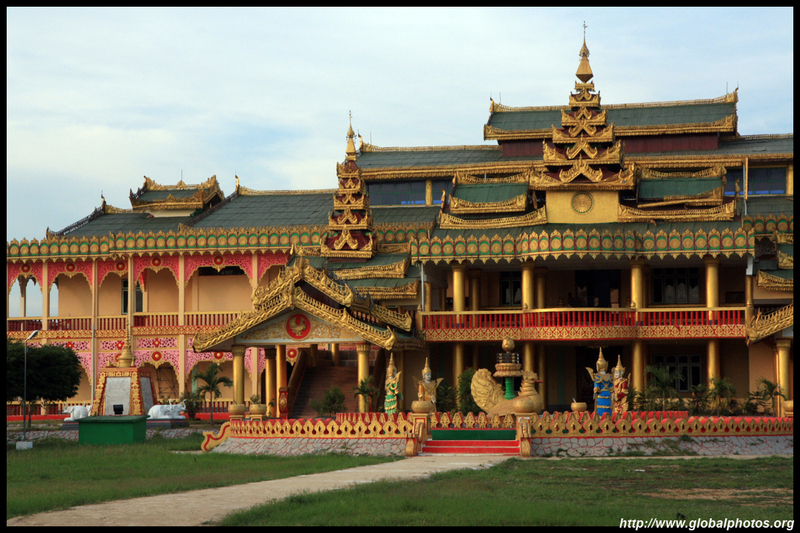 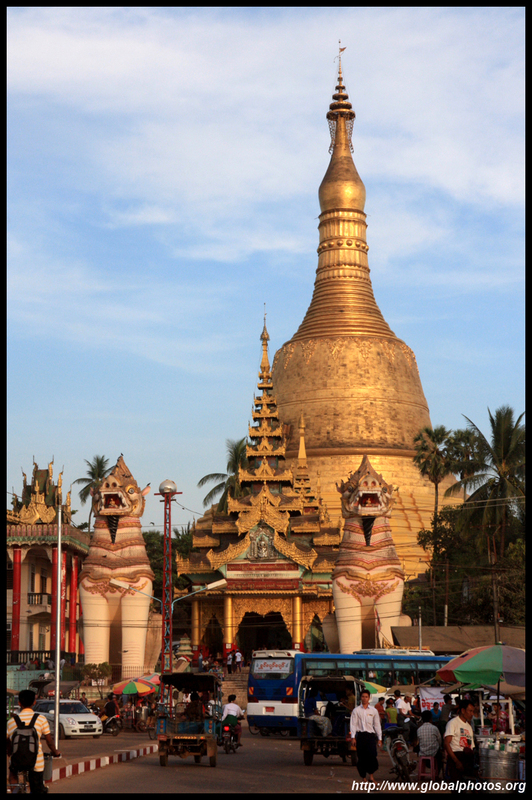 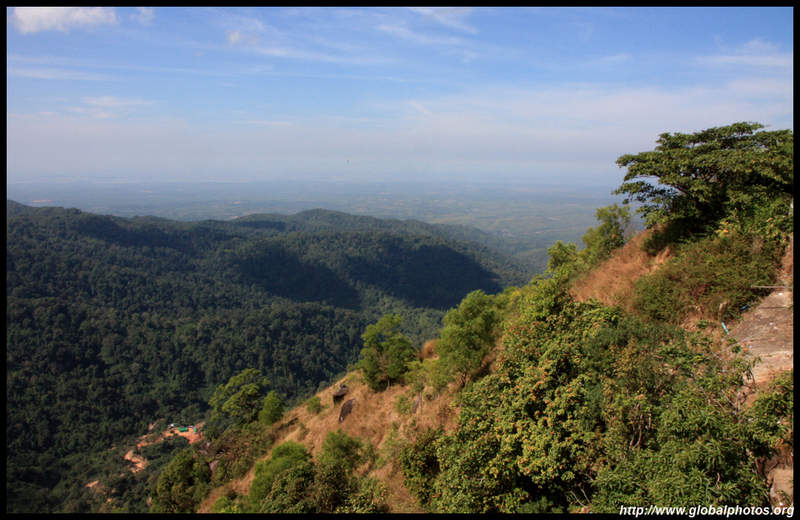 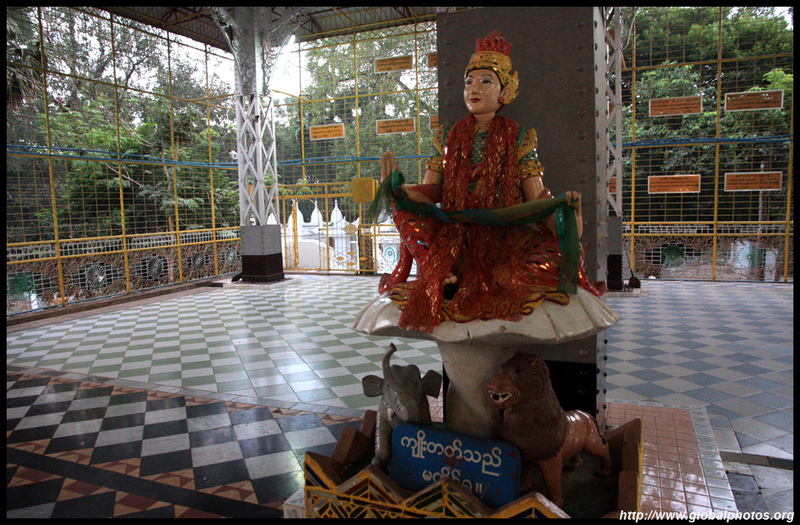 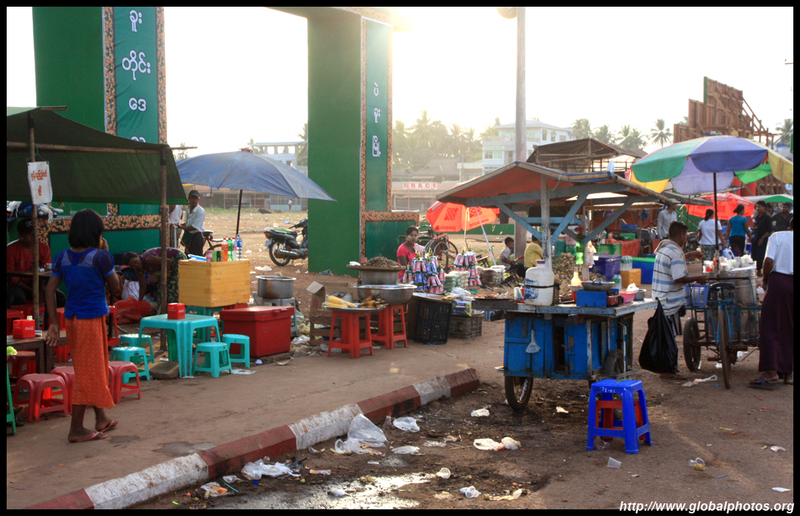 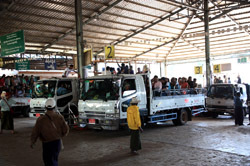 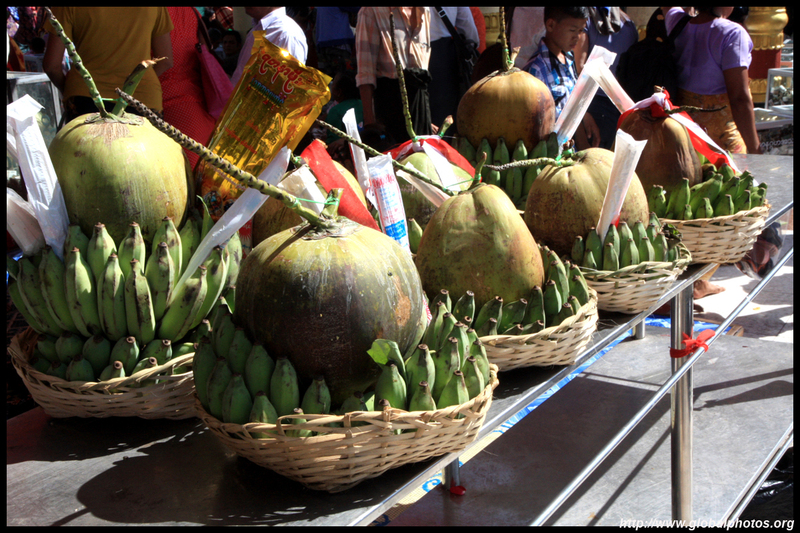 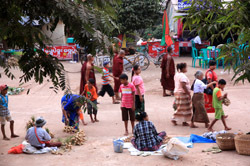 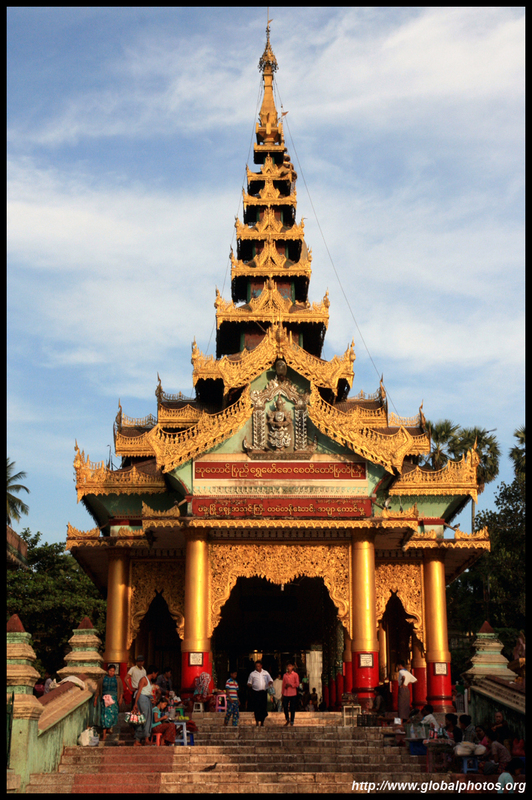 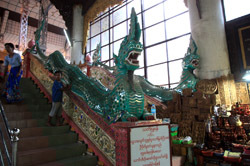 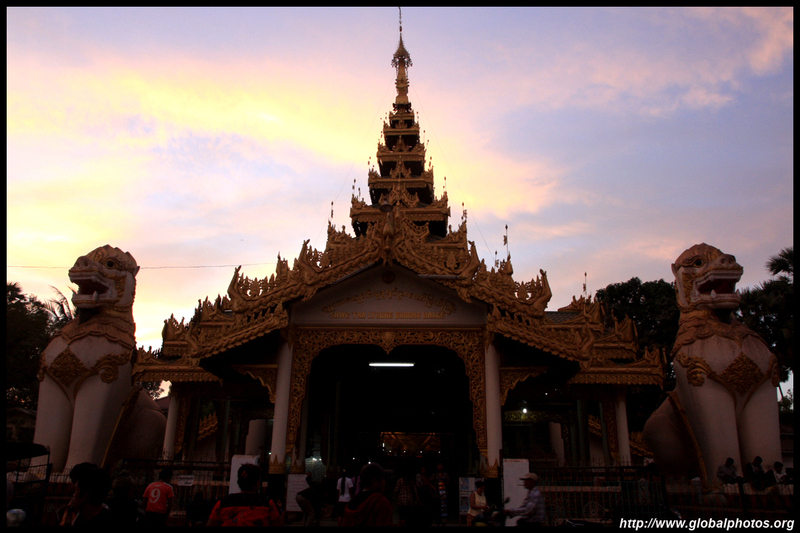 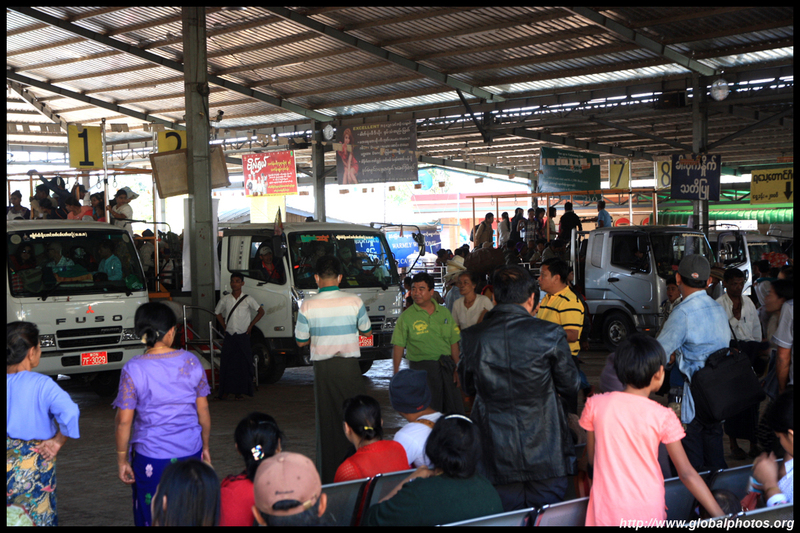 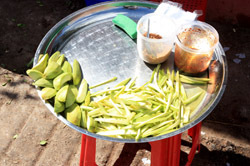 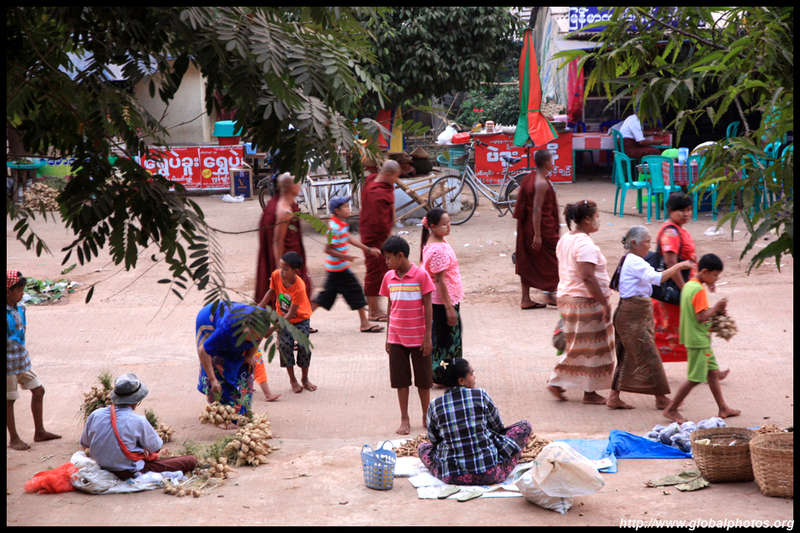 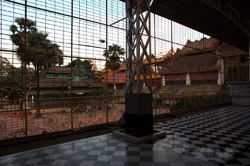 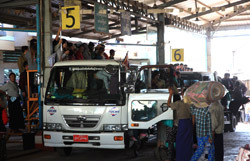 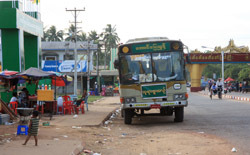 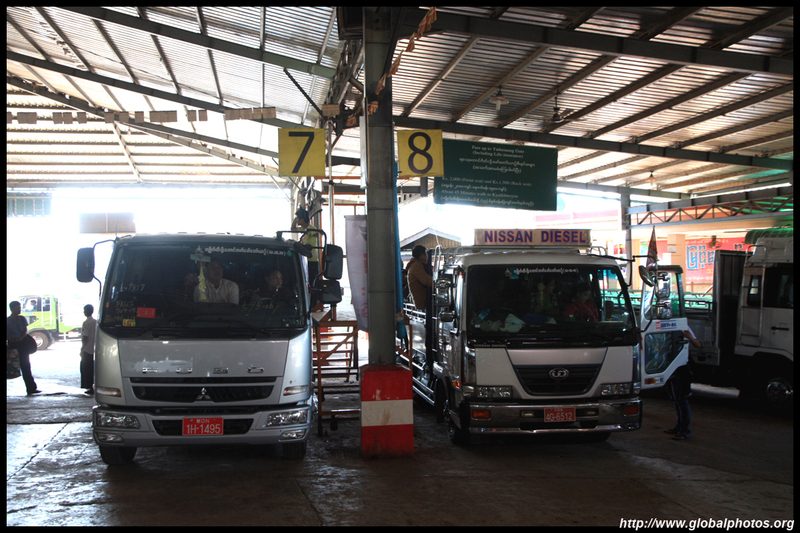 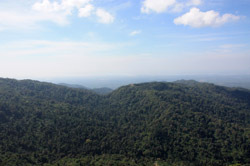 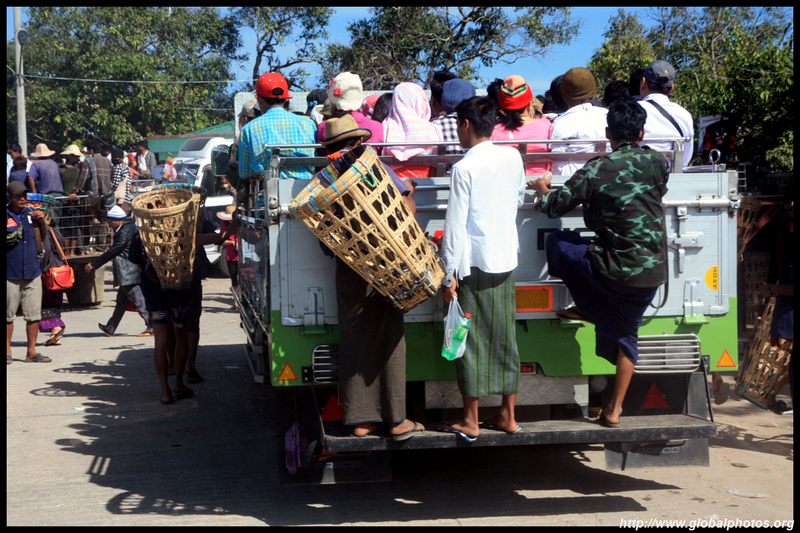 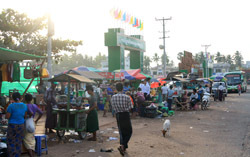 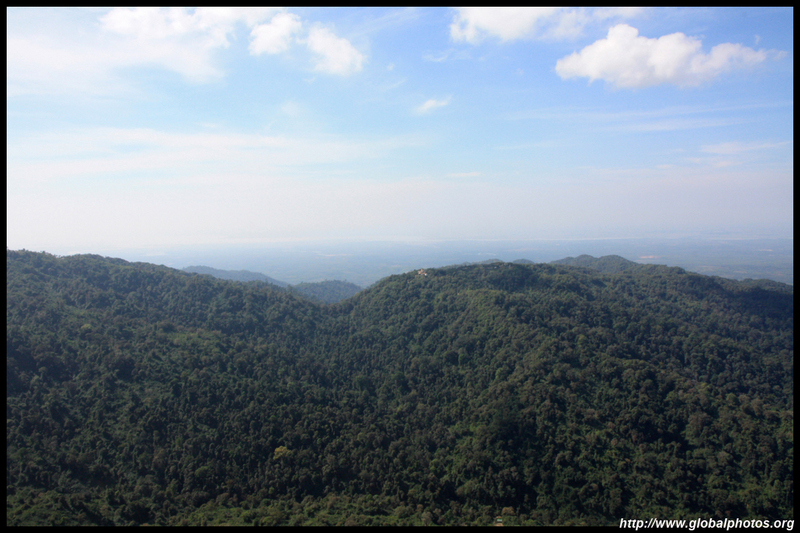 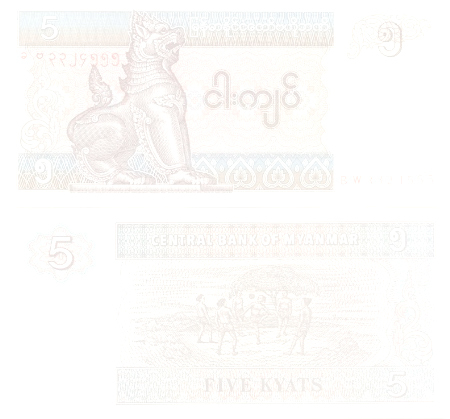 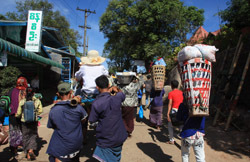 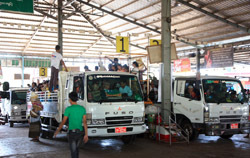 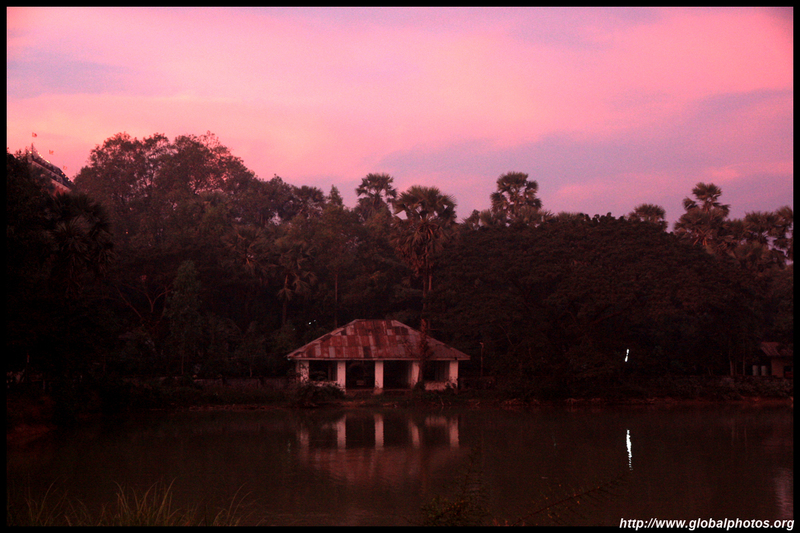 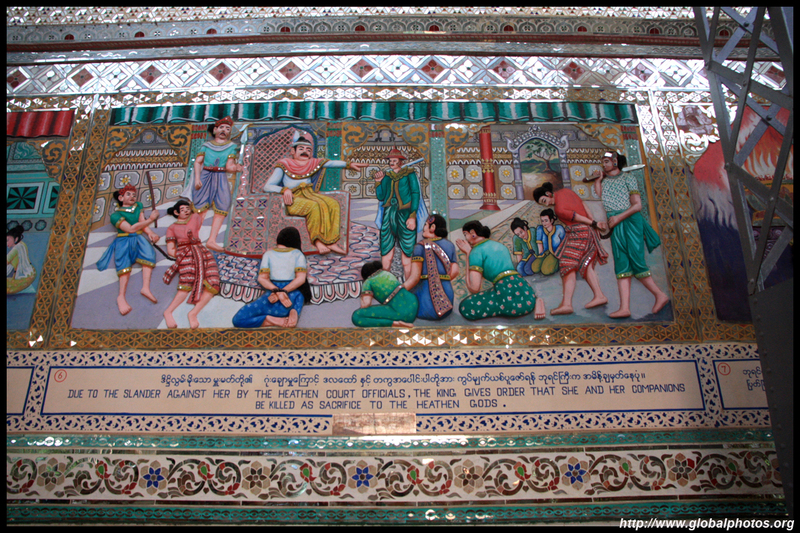 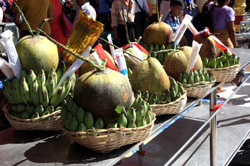 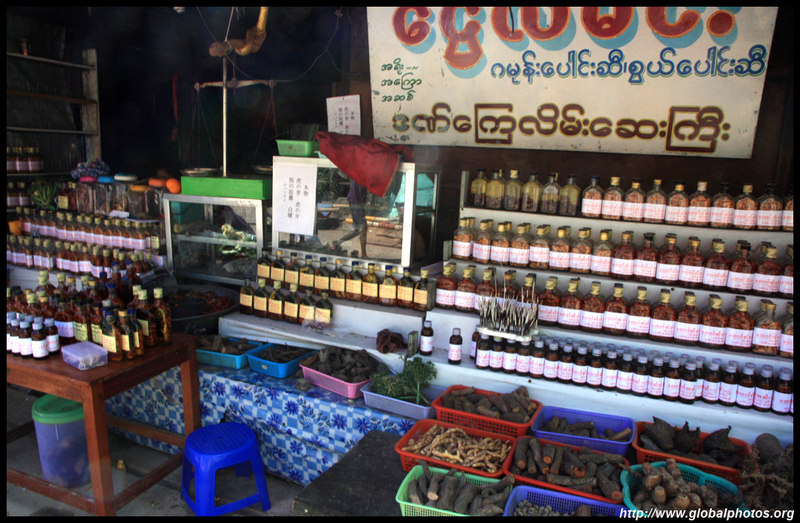 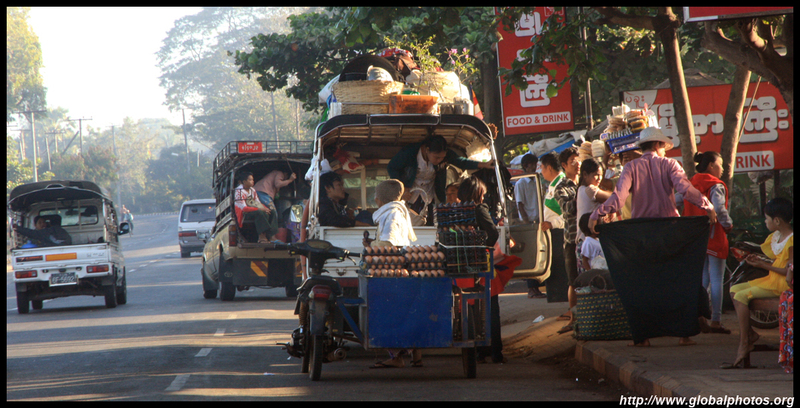 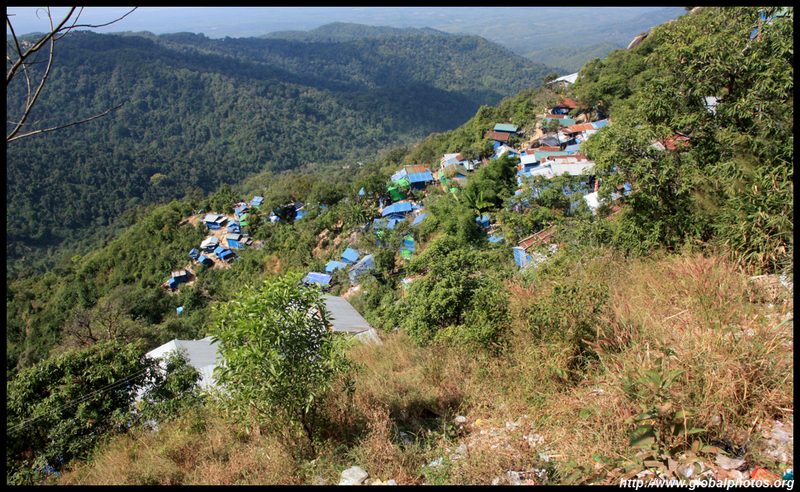 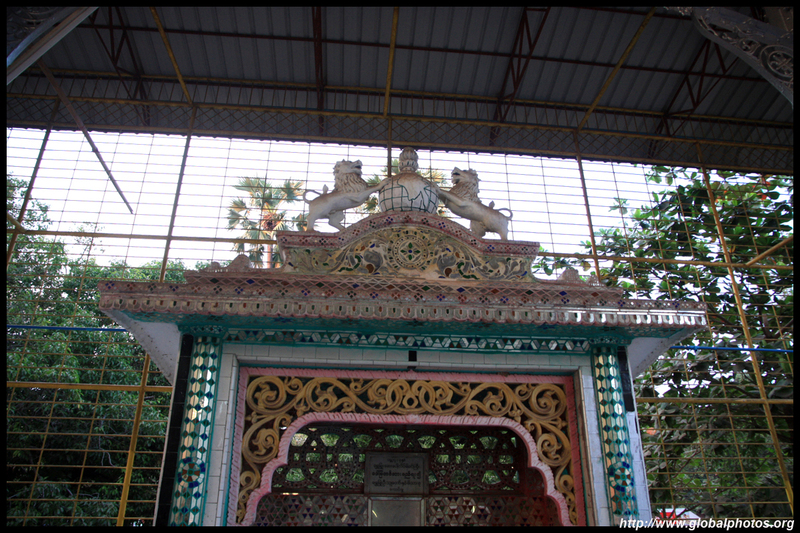 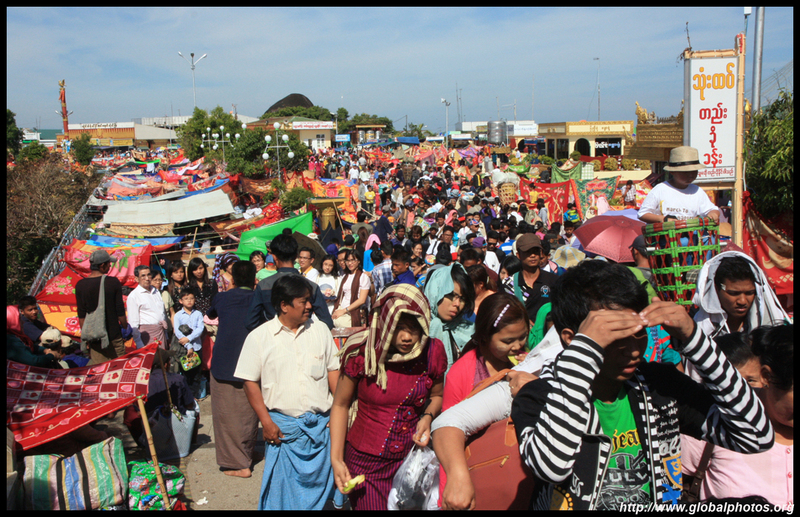 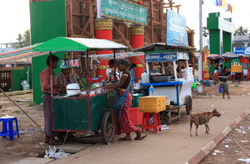 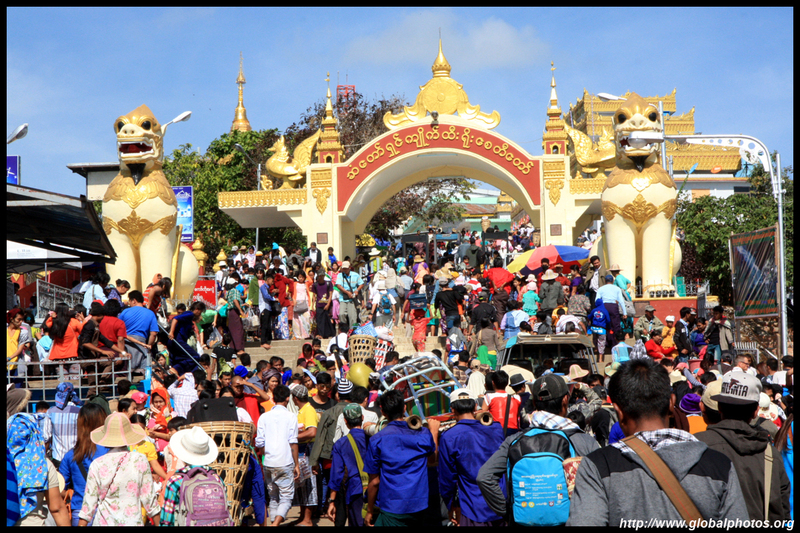 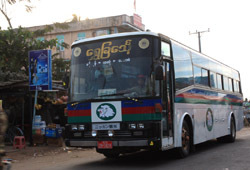 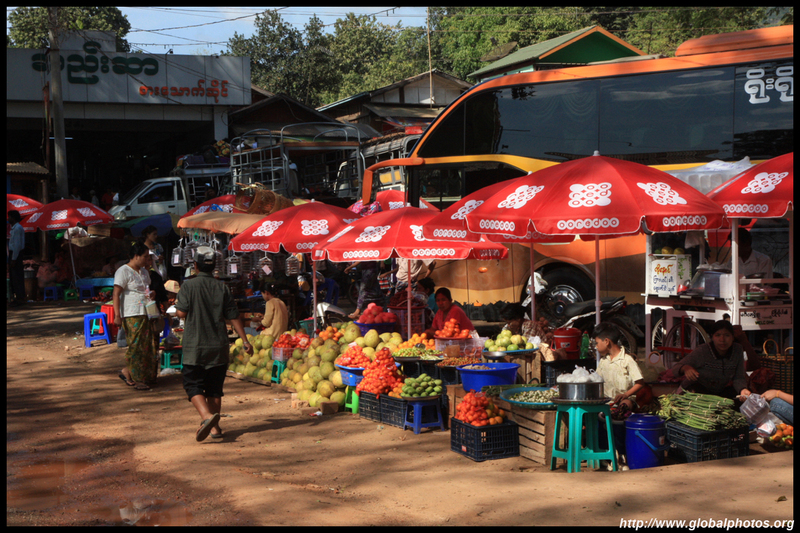 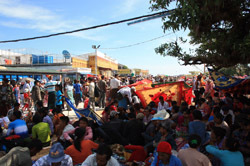 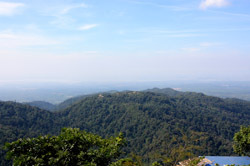 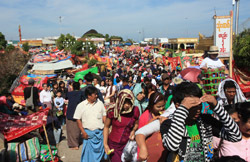 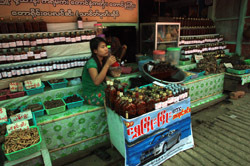 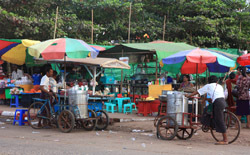 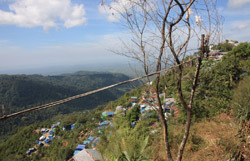 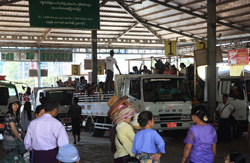 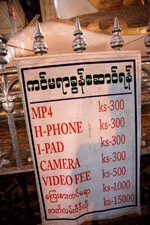 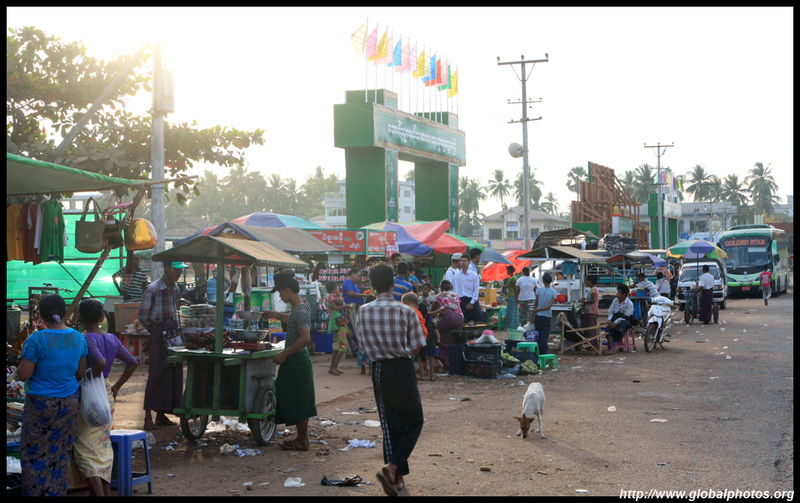 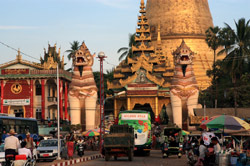 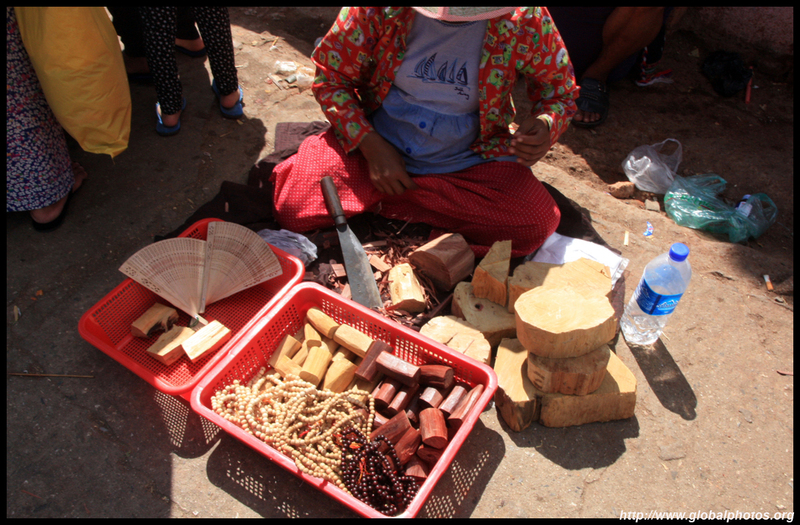 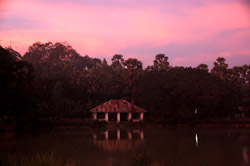 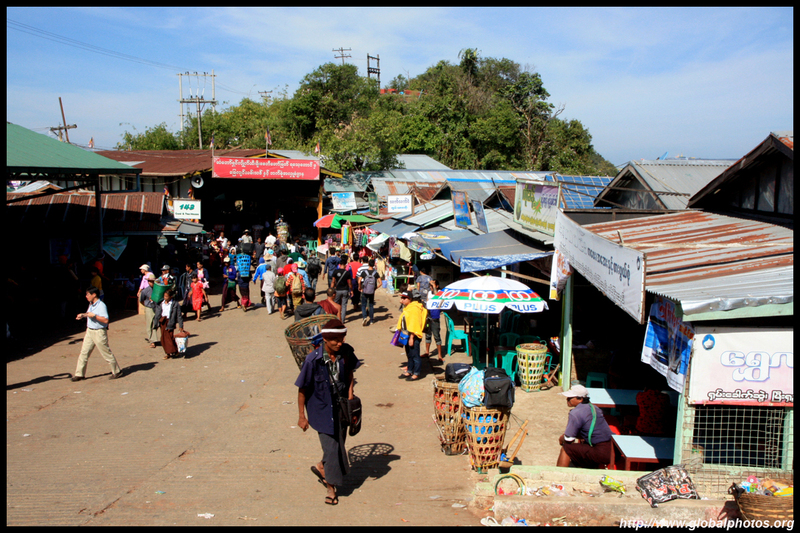 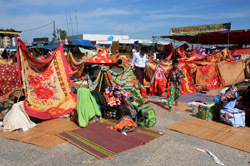 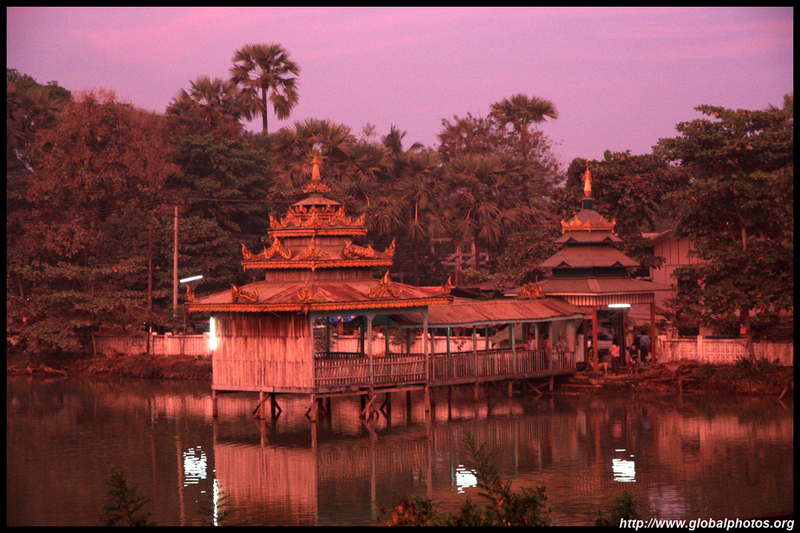 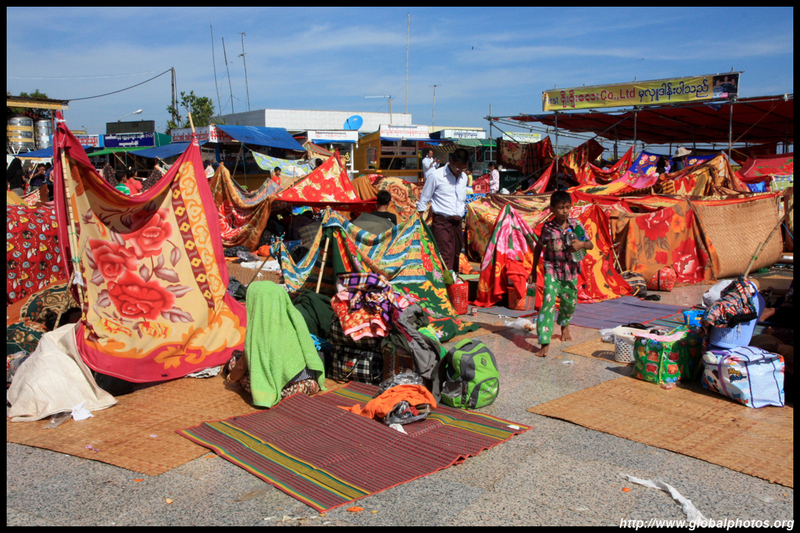 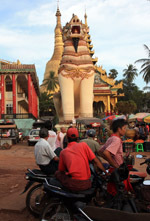 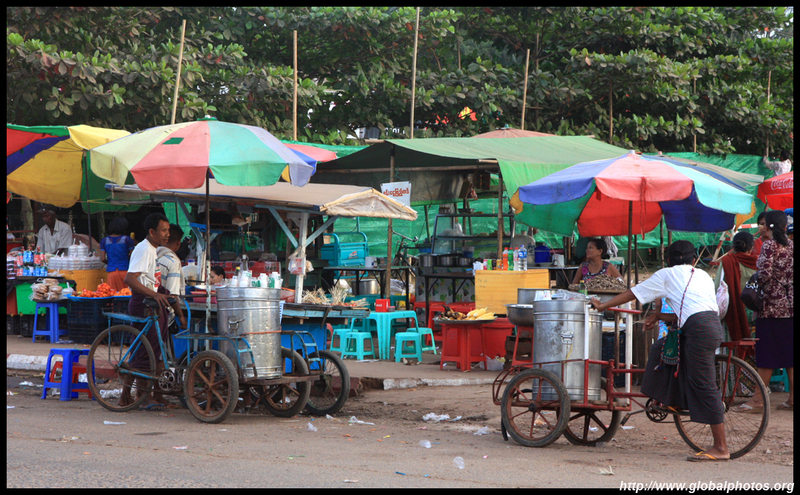 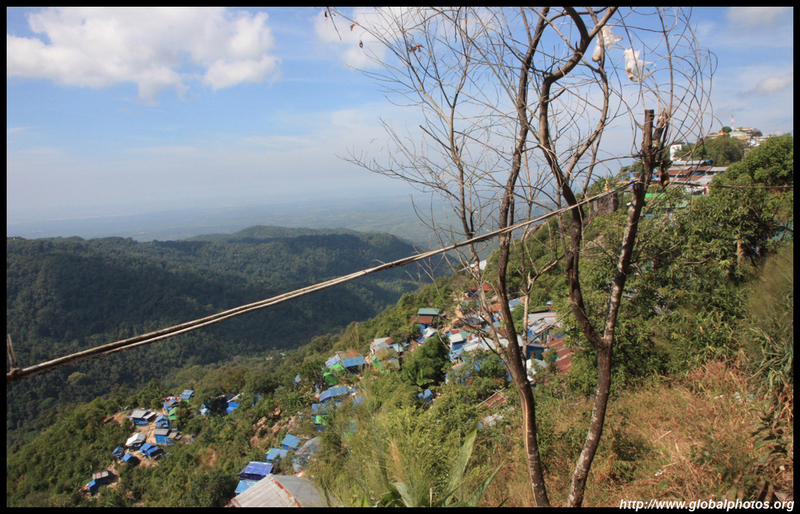 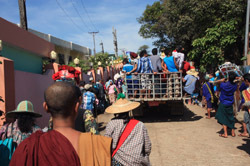 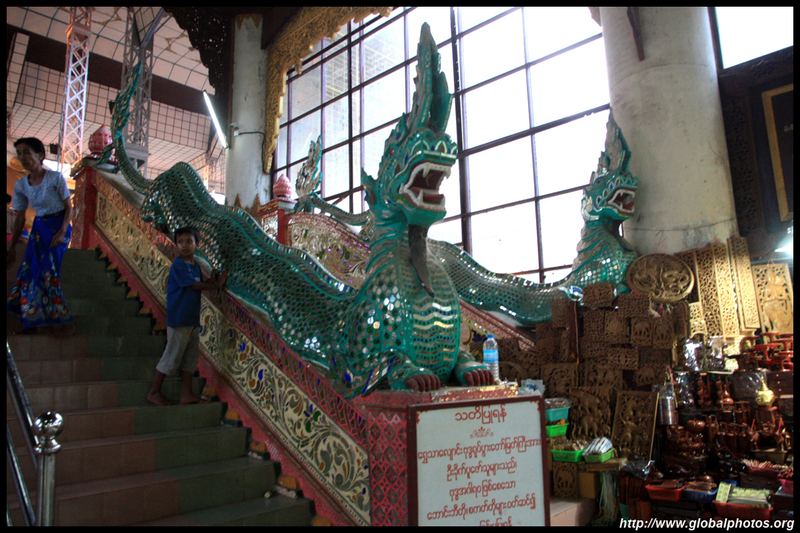 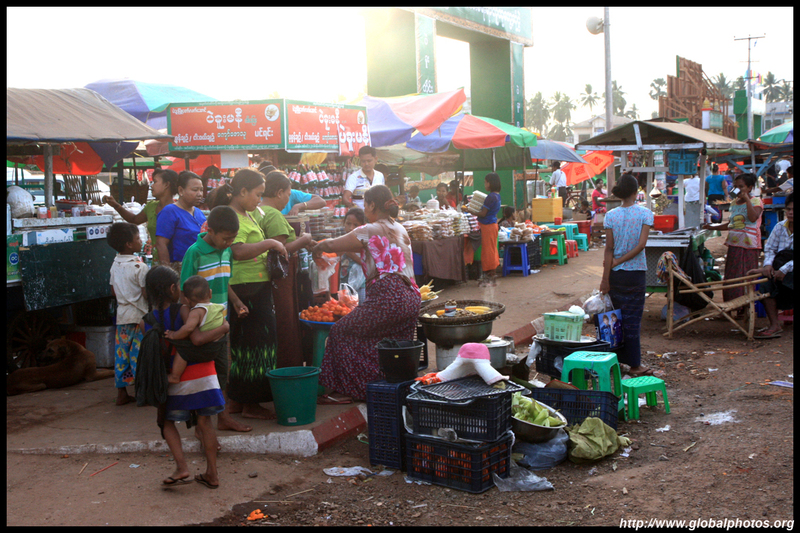 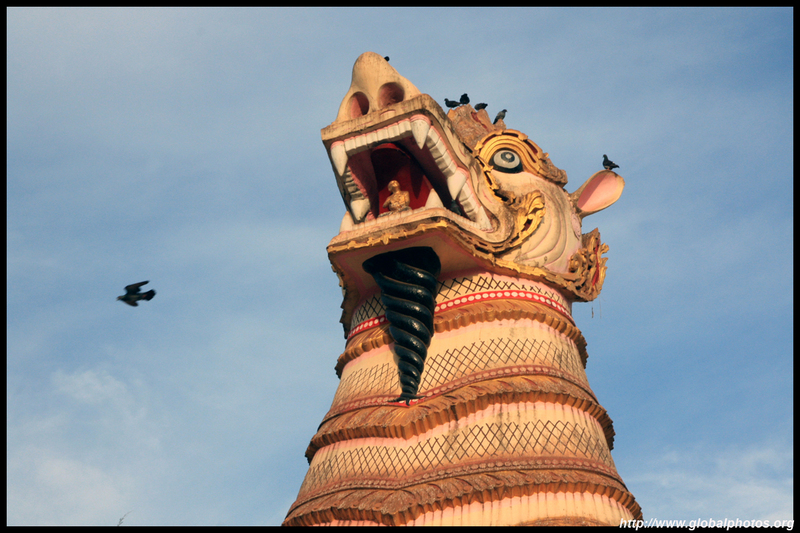 It is possible to visit as a day trip from Yangon, but you need to set out before sunrise to start the 3-hour journey. 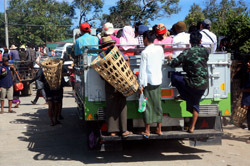 We weren't alone on the road. 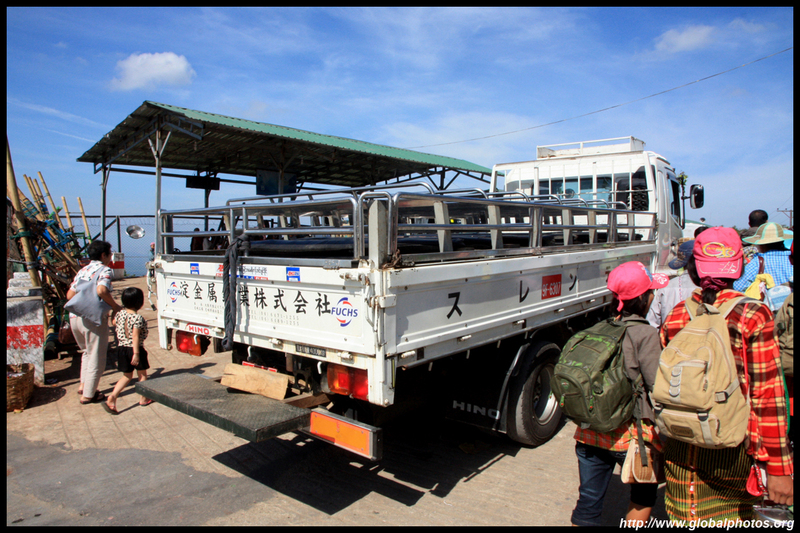 We got dropped off at the truck station, where we need to book a seat to ascend to the site. There are 3 options : (i) a seat on the back of the big pick-up truck; (ii) a more expensive seat at the front cab; (iii) pay for all 5 front cab seats. 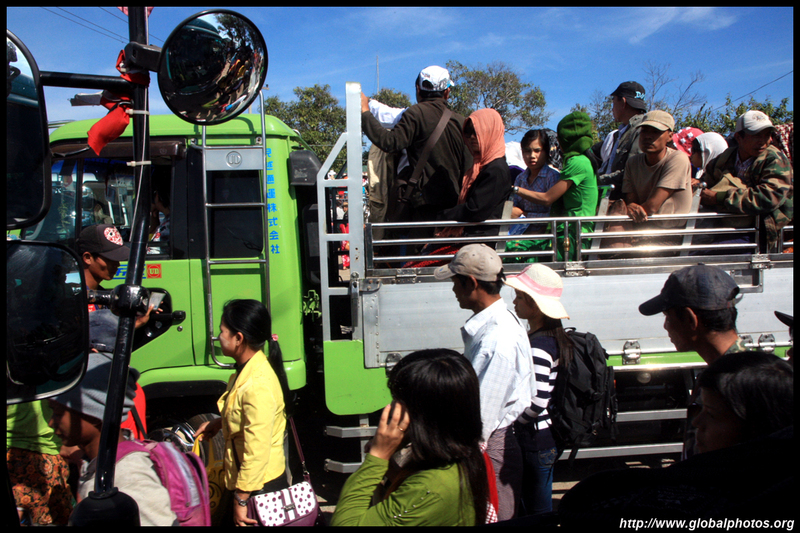 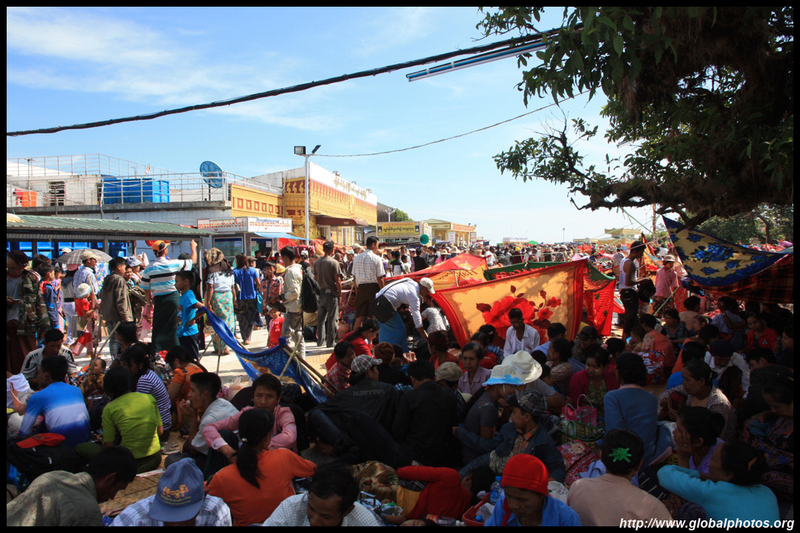 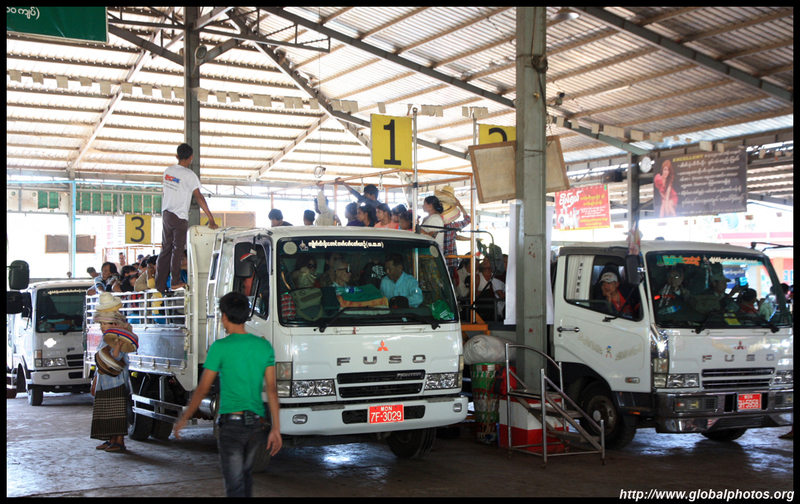 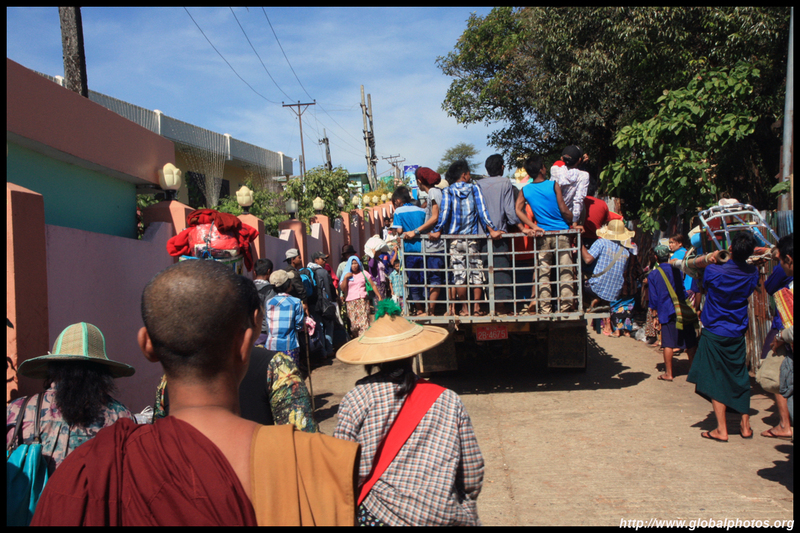 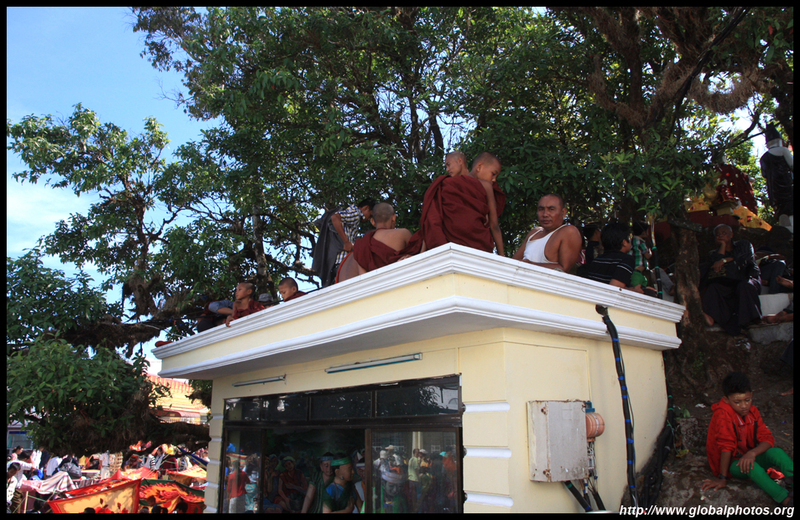 The station was packed with people rushing to climb onto the pick-up trucks, which was quite an experience to see and hear. 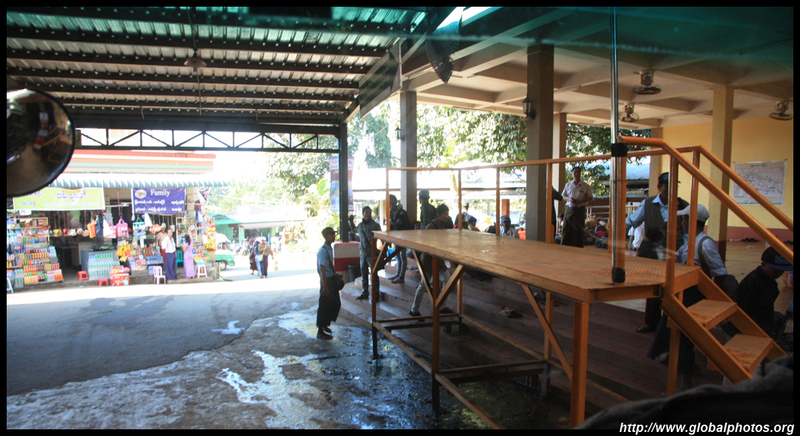 For those sitting at the back, they need to climb these platforms to make it easier to reach their bench seats. 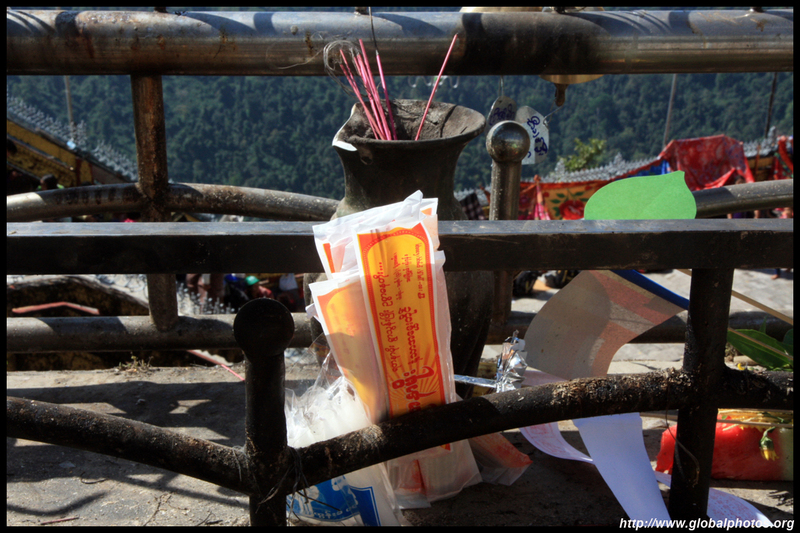 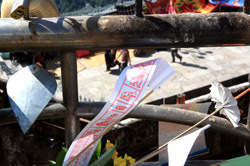 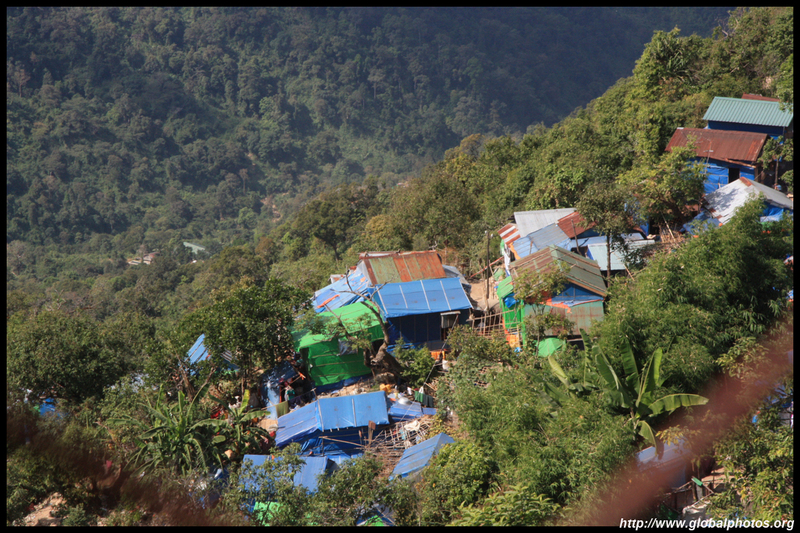 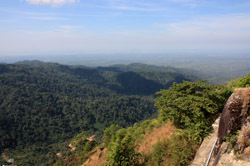 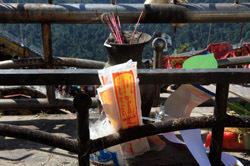 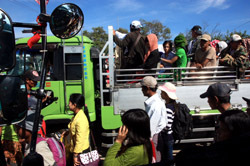 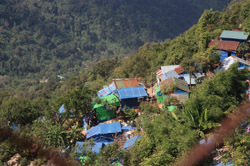 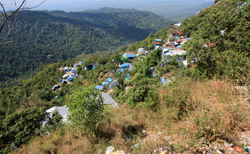 It was a 20-minute journey up winding mountain roads, with stops along the way where groups of "poor" people came with buckets to collect well-wishers' donations. 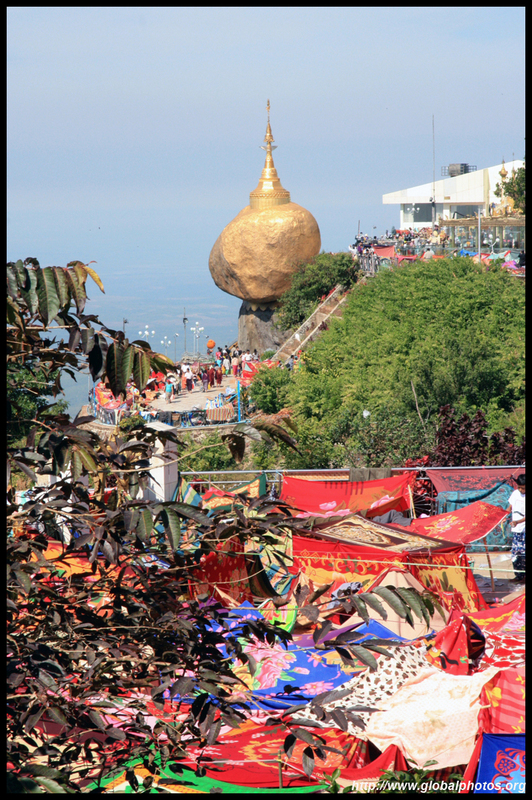 We made it to the top where the mad scramble began again as worshippers descended and touts were everywhere trying to carry their baggage or even them onto their sedan chairs. 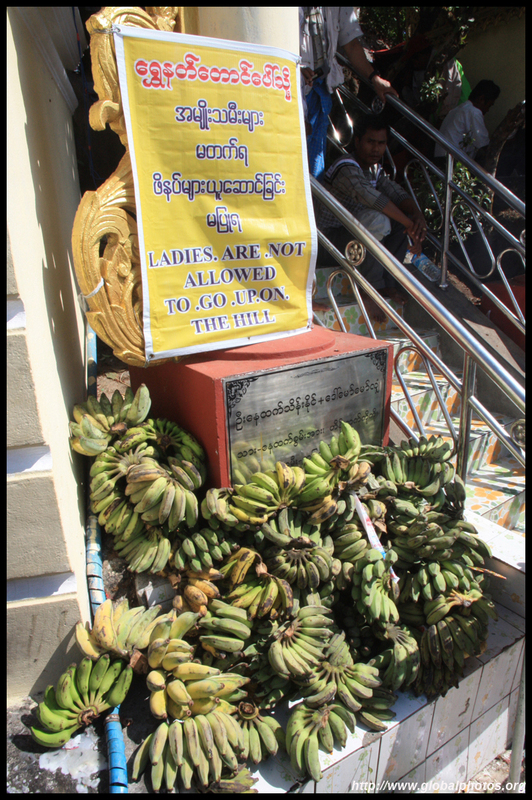 To get in, you need to take off your shoes, just like any other Buddhist temple. With so many people going through this location, the ground is not clean at all, but you just need to bear with it. 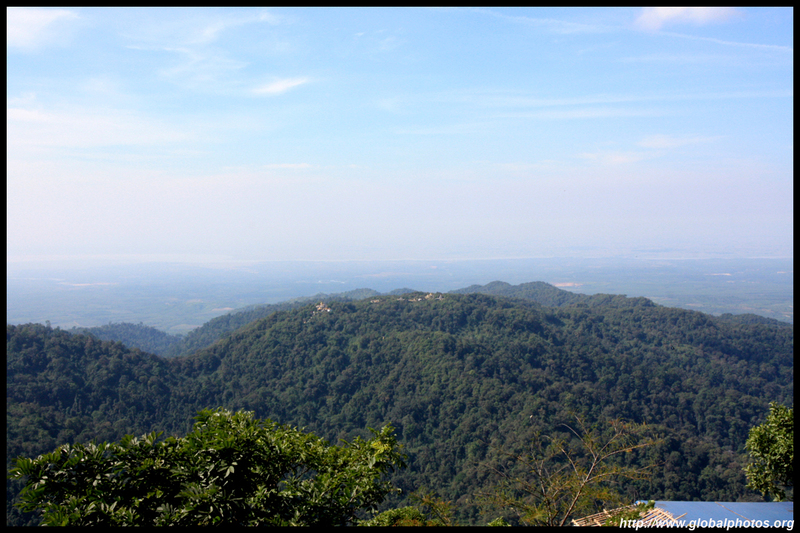 After so many hours on the road, would you turn back here? 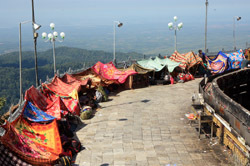 Plenty of pilgrims appear to have been camping here overnight. 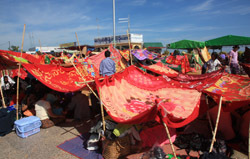 Their sea of colourful blankets were quite a sight. 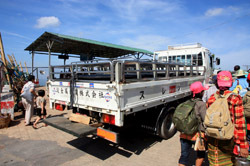 It was not possible to book a front cab down, so we had to cope with the bench seats at the open-deck back of the pick-up truck. 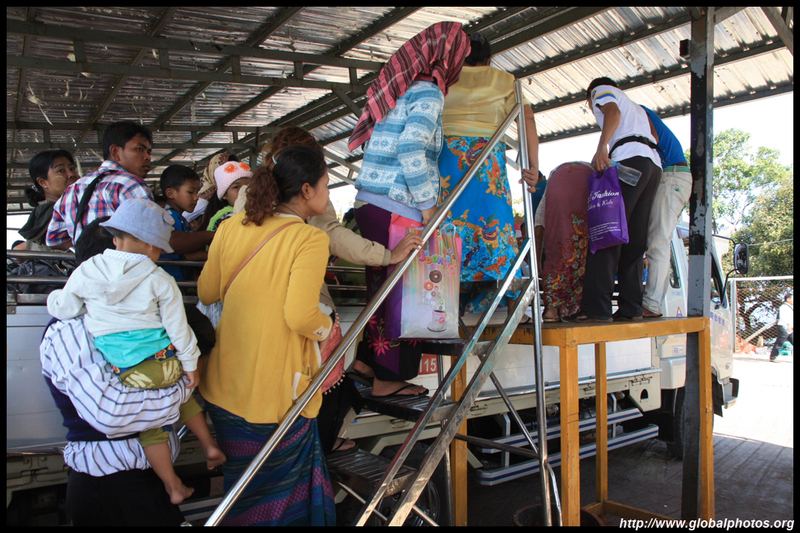 It was a struggle to climb up onto the platform to board and they really cram the maximum number of people possible onto the benches. 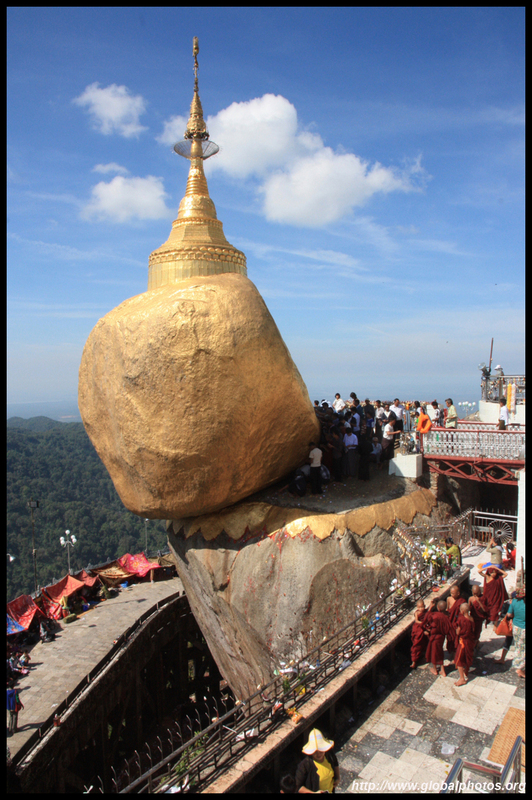 With barely any sight-line, people were throwing up along the winding journey down, so it wasn't a very good end to this pilgrimmage. 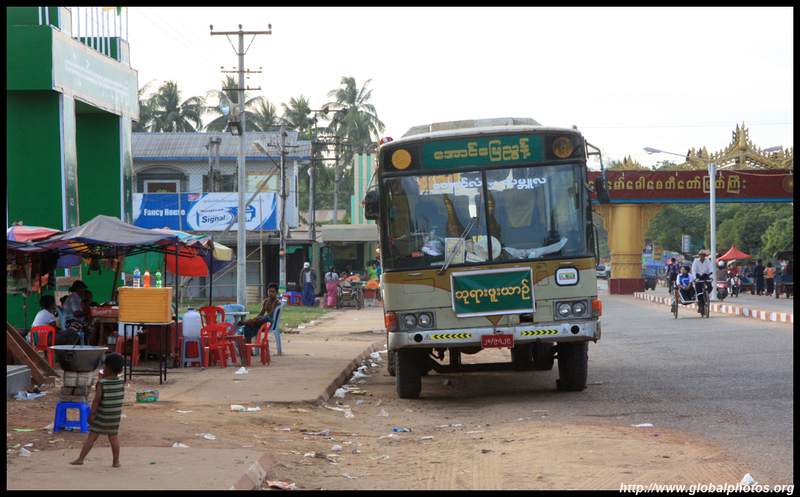 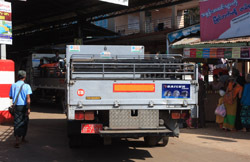 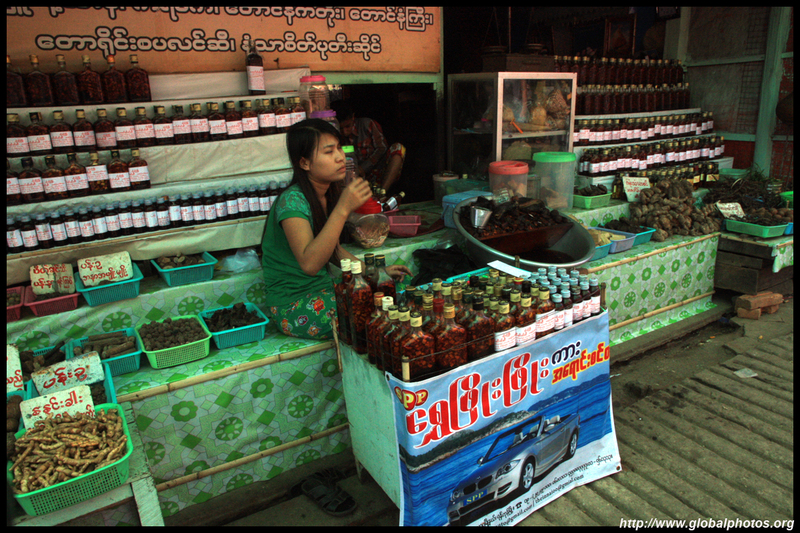 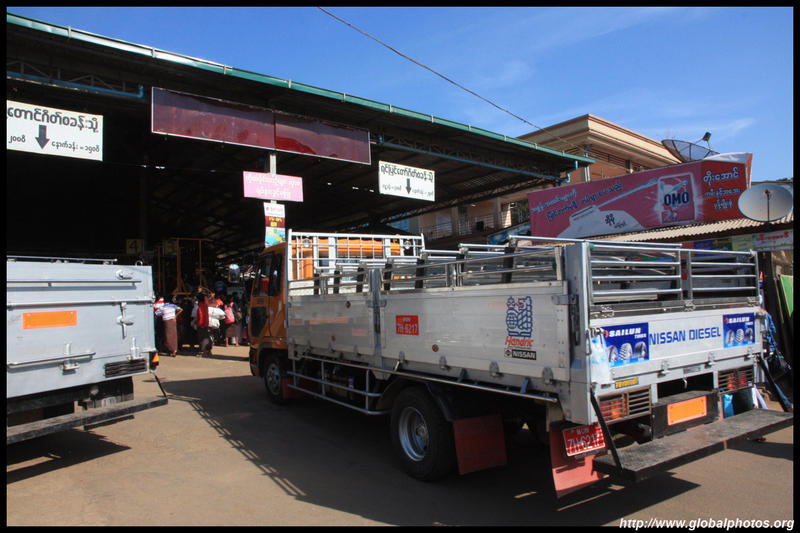 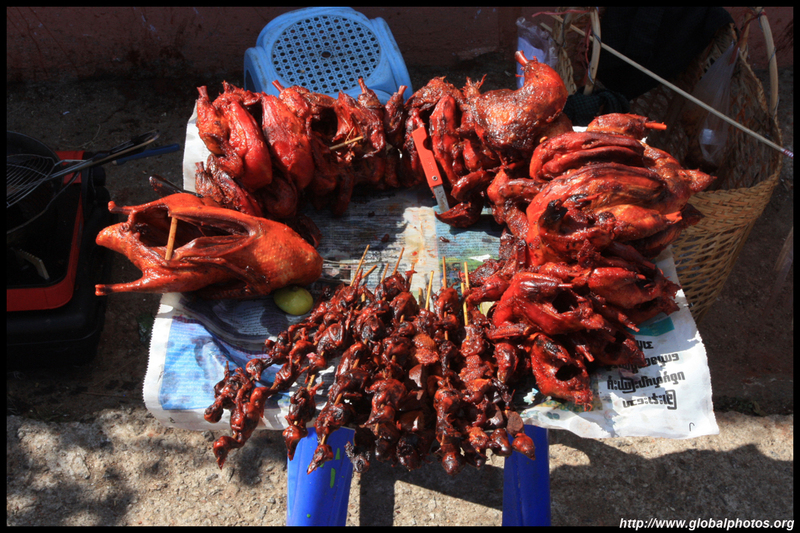 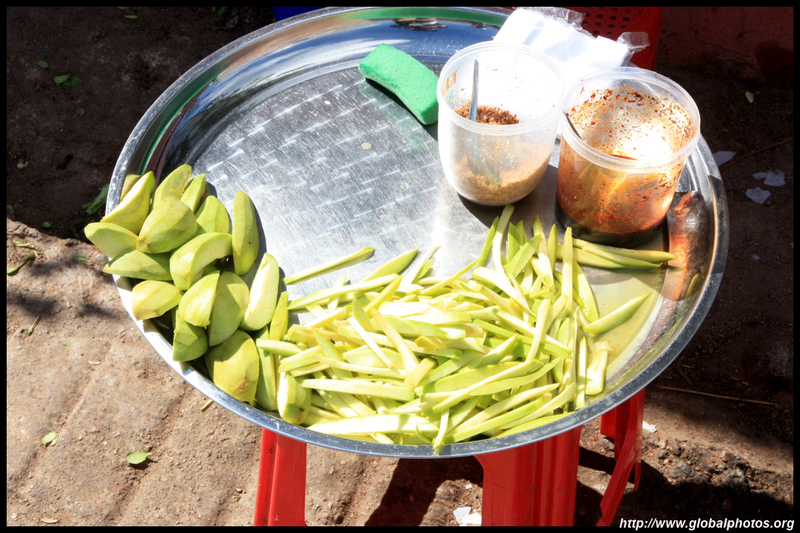 We made a brief stop in Bago on the way back. 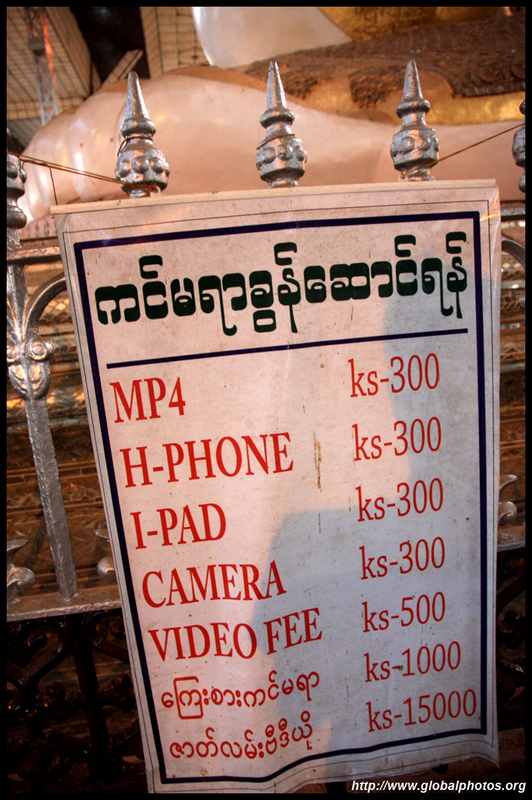 Having visited Bagan on the previous day, the temples here were not so interesting in comparison. Shwemawdaw Pagoda is actually taller than Yangon's Shwedagon, reaching 114m high. 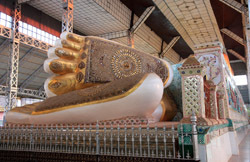 I didn't want to take off my shoes again after a long clean-up at the Golden Rock, and having visited Shwedagon, I gave the interiors a pass. 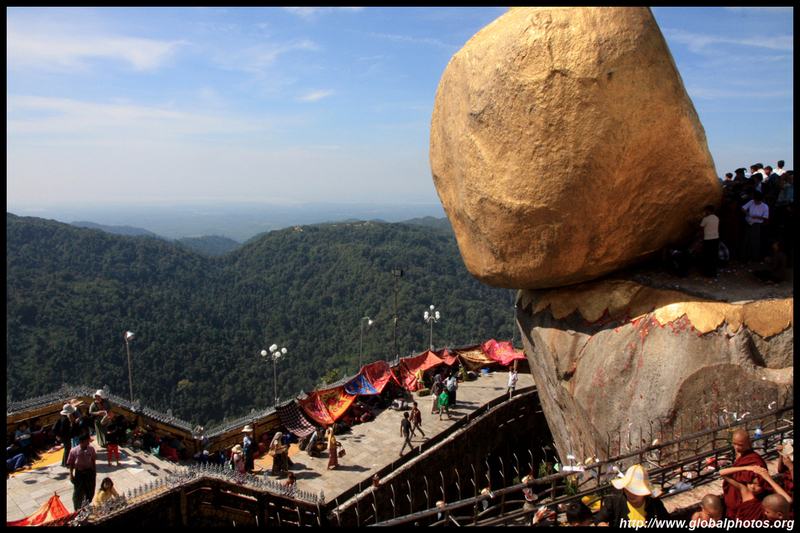 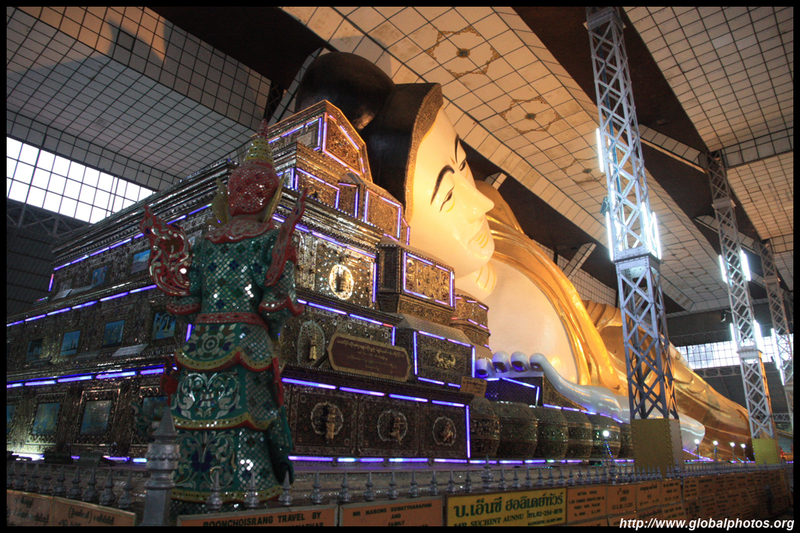 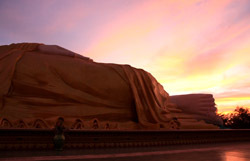 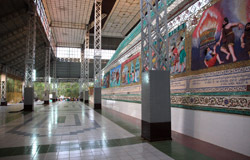 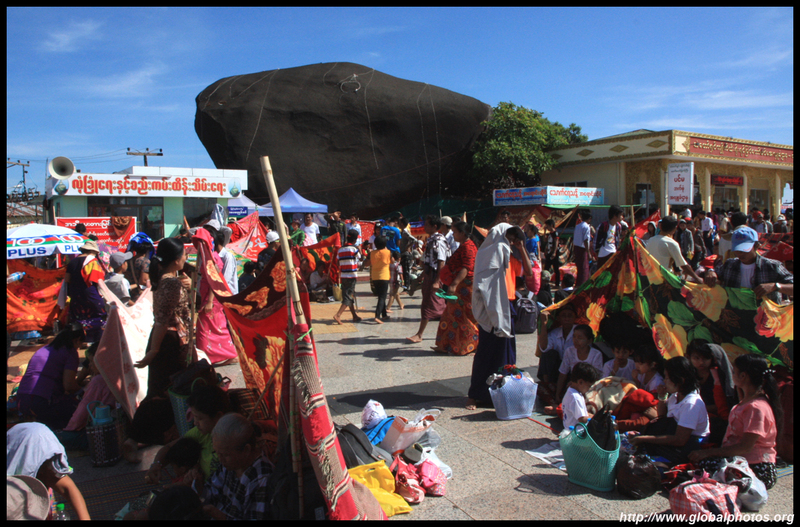 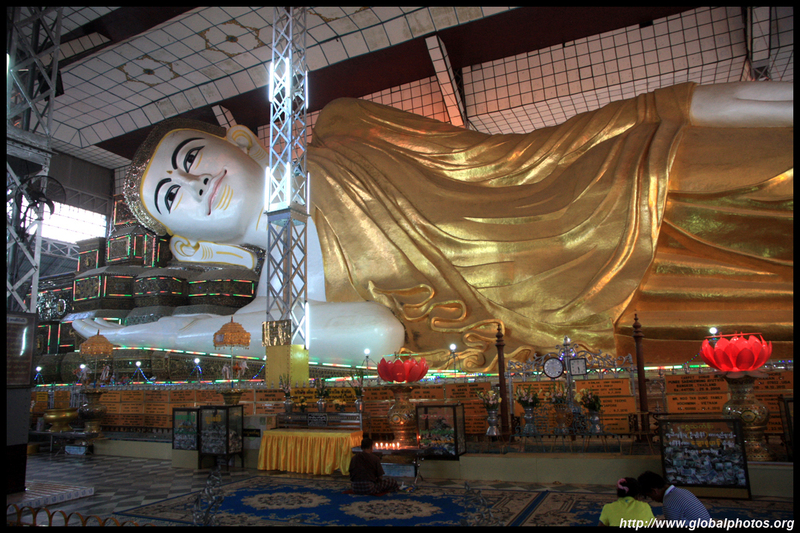 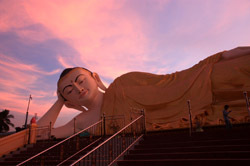 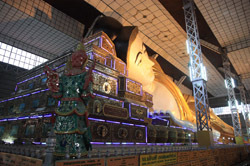 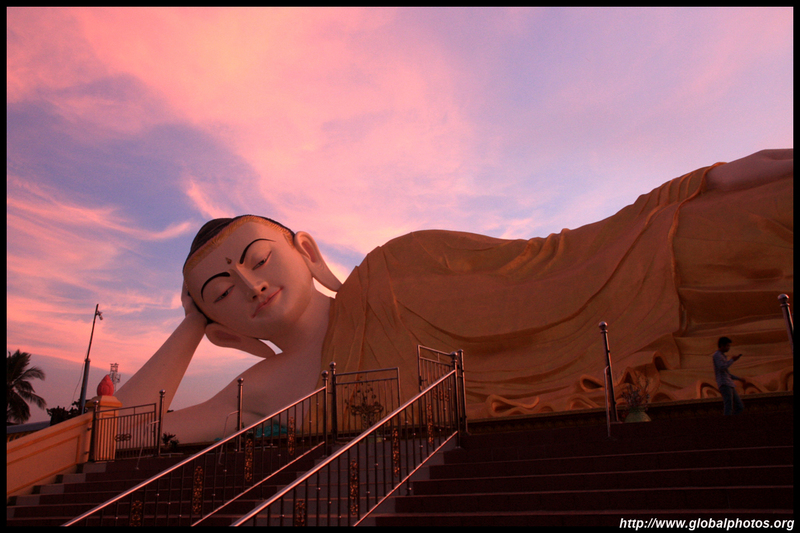 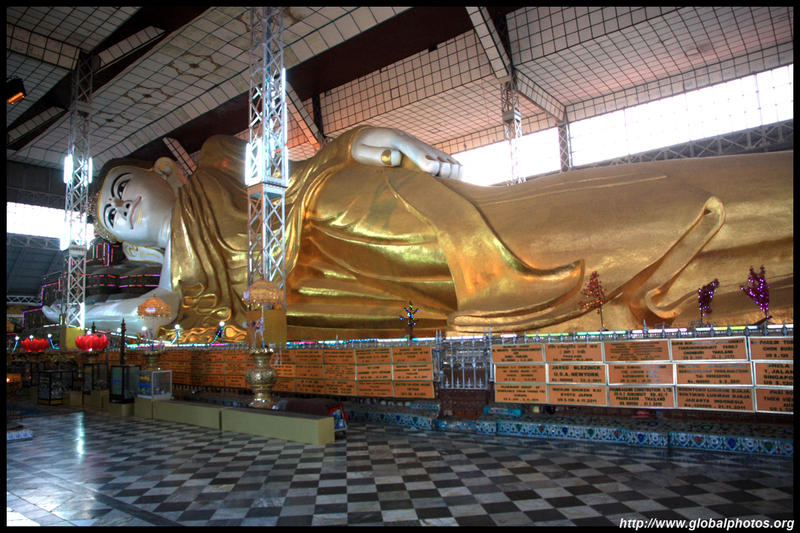 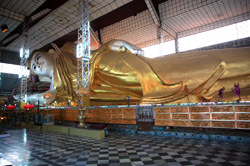 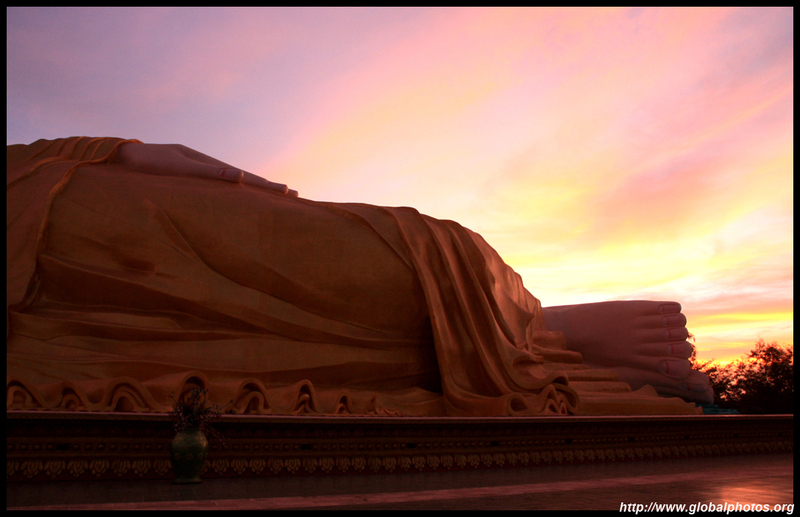 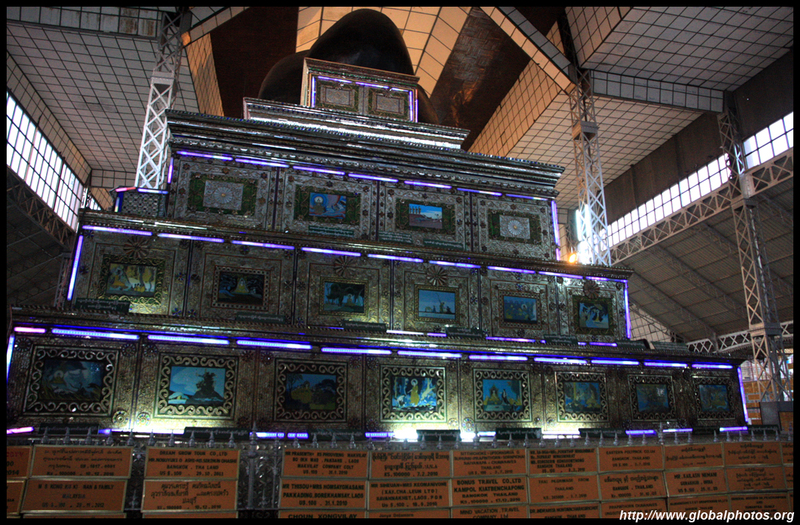 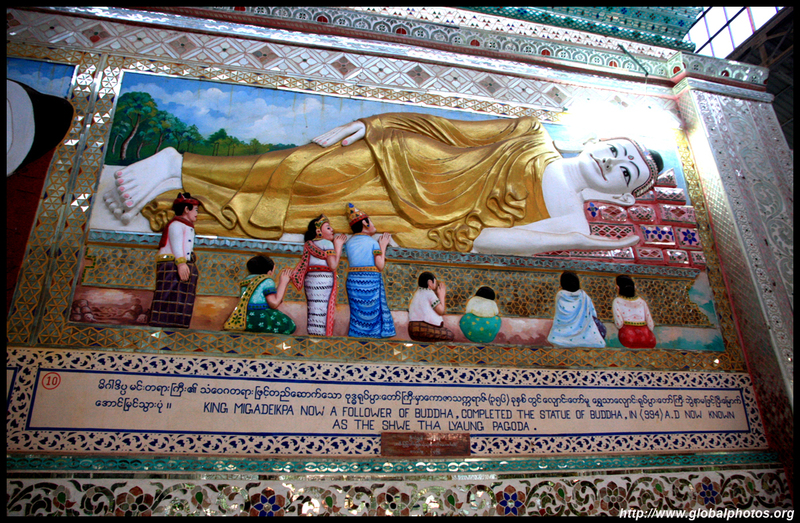 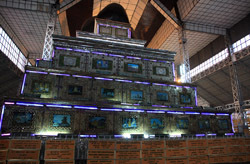 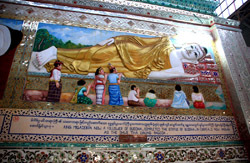 The Shwethalyaung Buddha is an indoor reclining Buddha that stretches 55m long and 16m high. It was originally found by construction workers in the late 19th century in a decayed state. 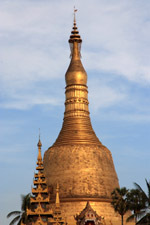 The last renovation took place in 1948. 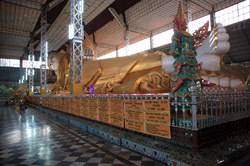 There is also an outdoor reclining Buddha nearby.